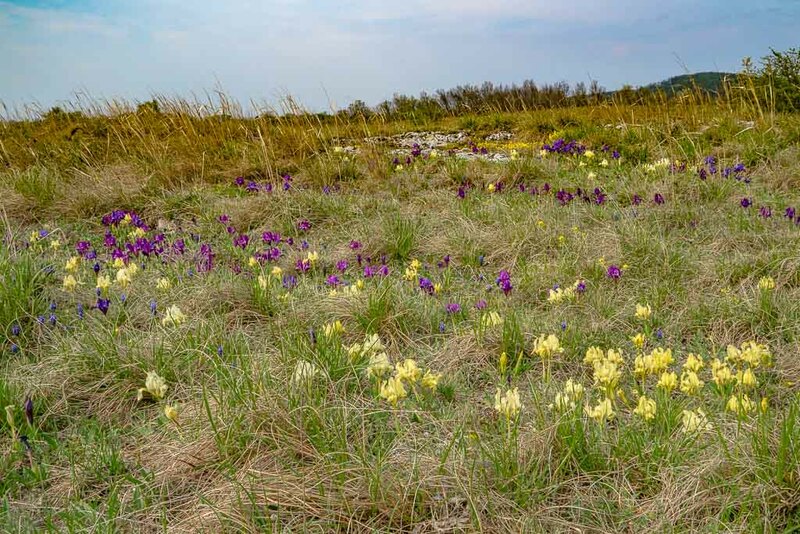 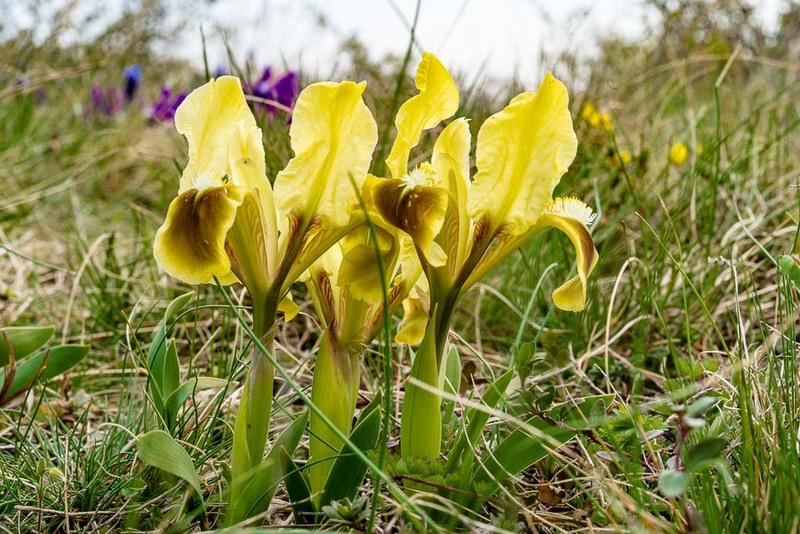 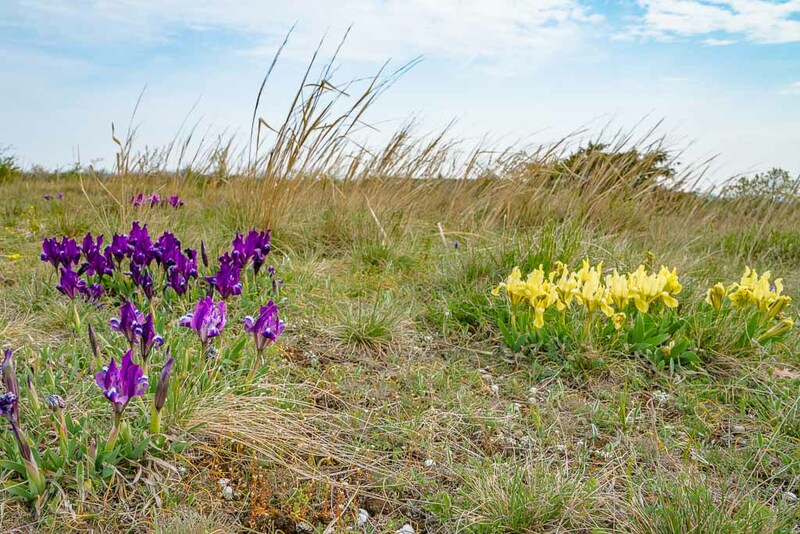 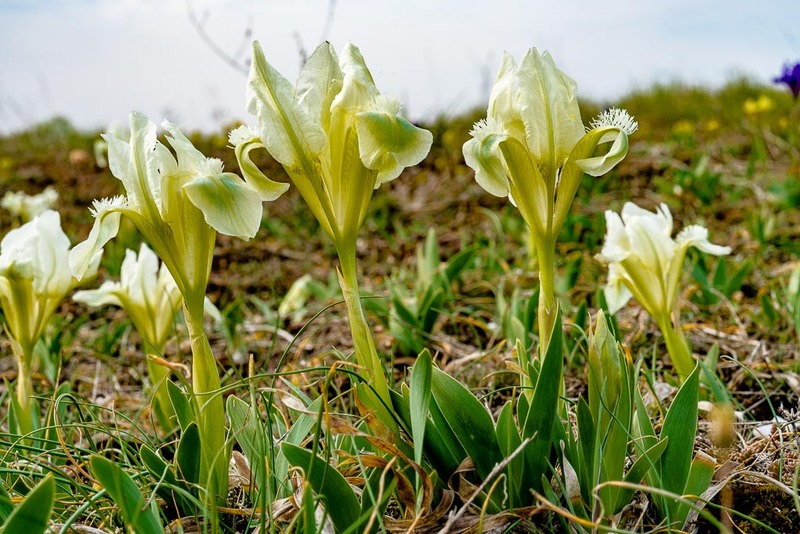 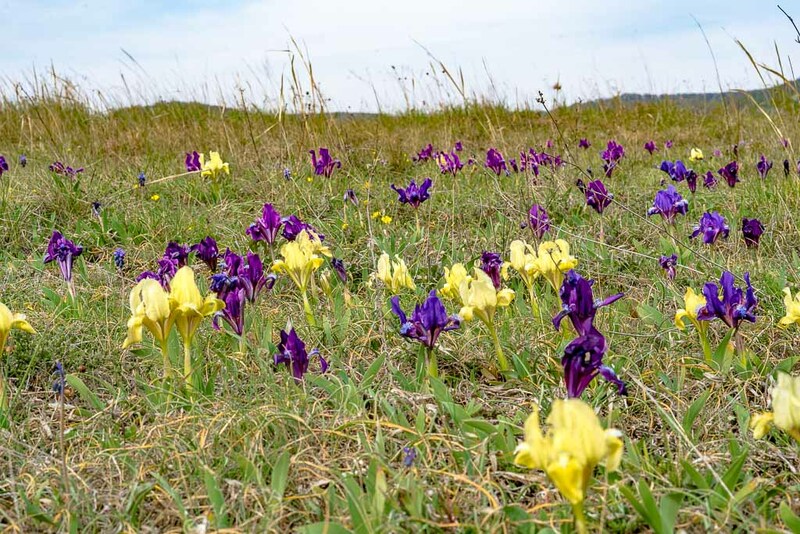 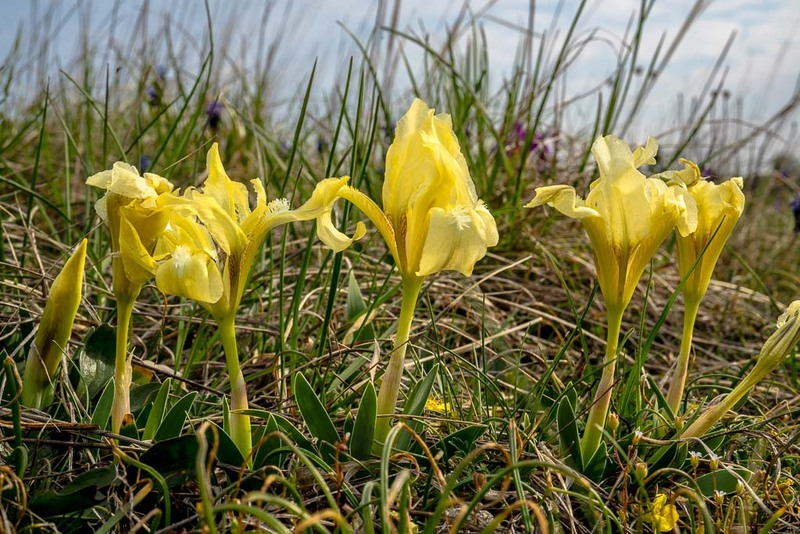 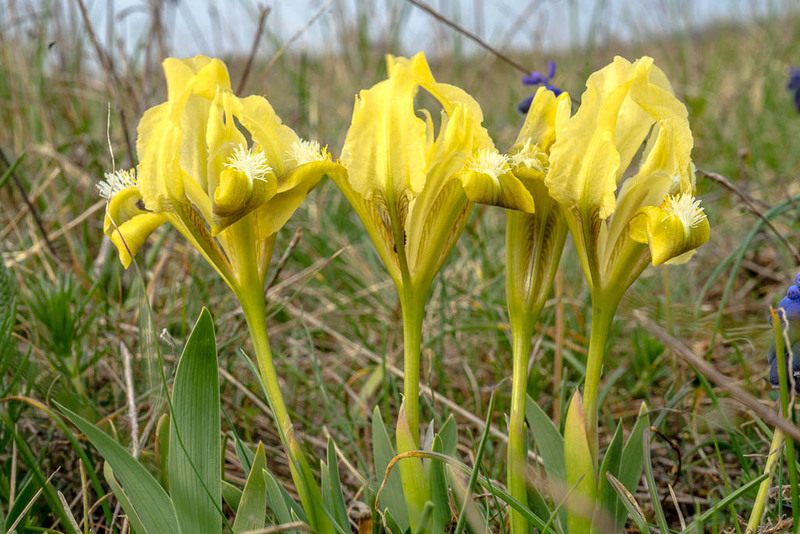 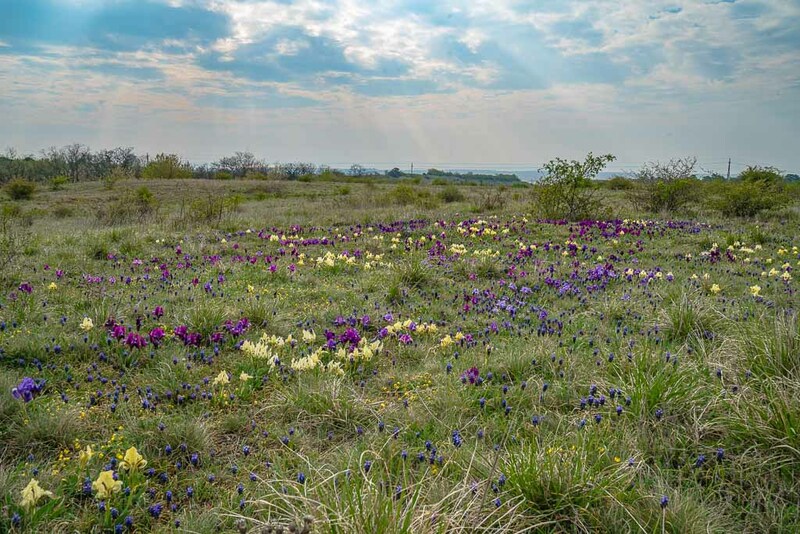 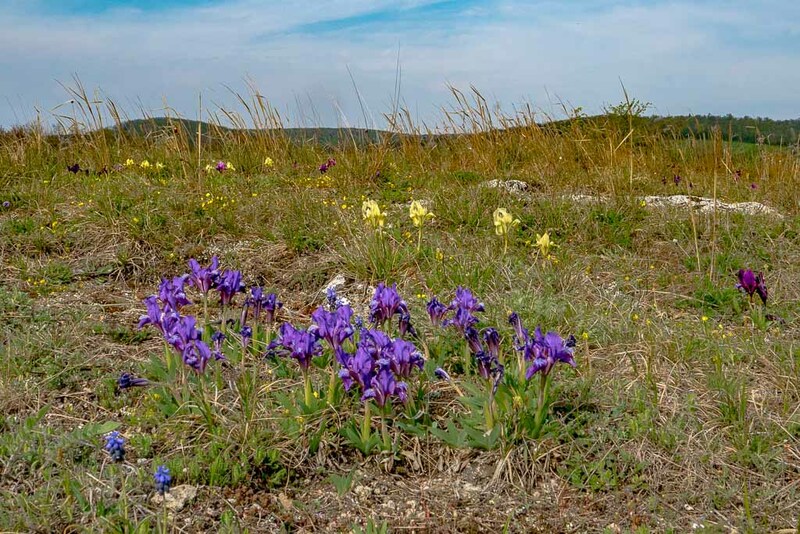 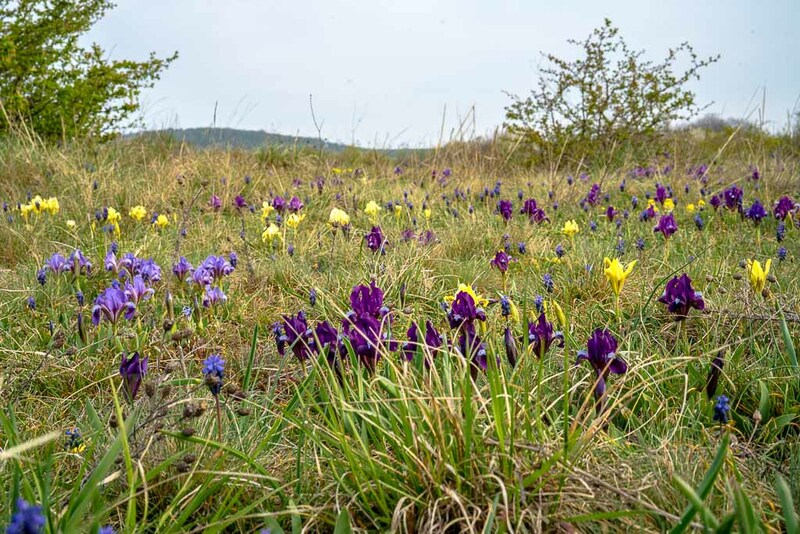 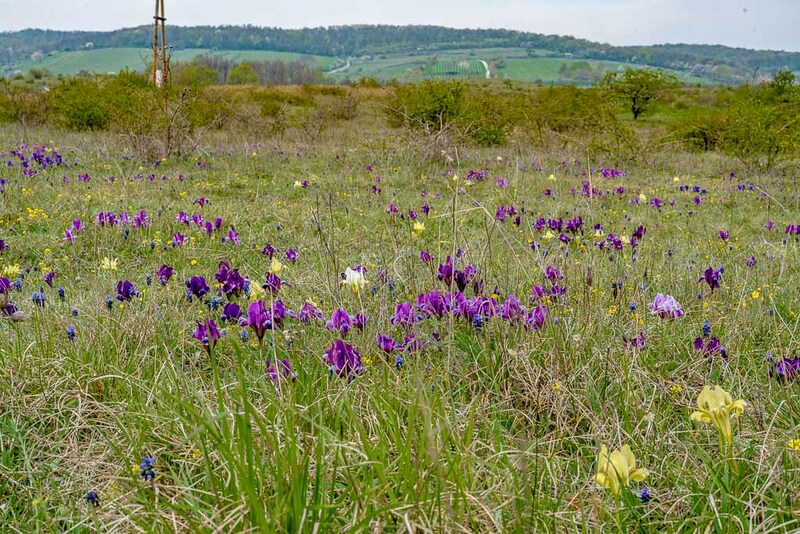 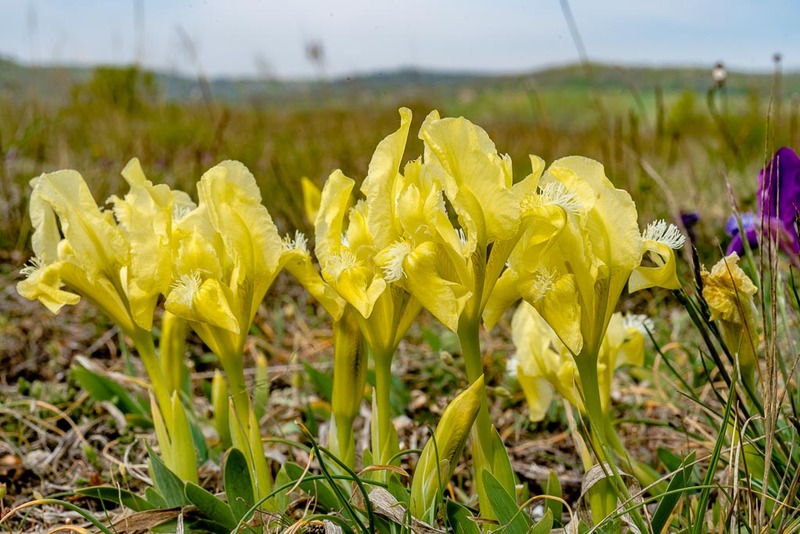 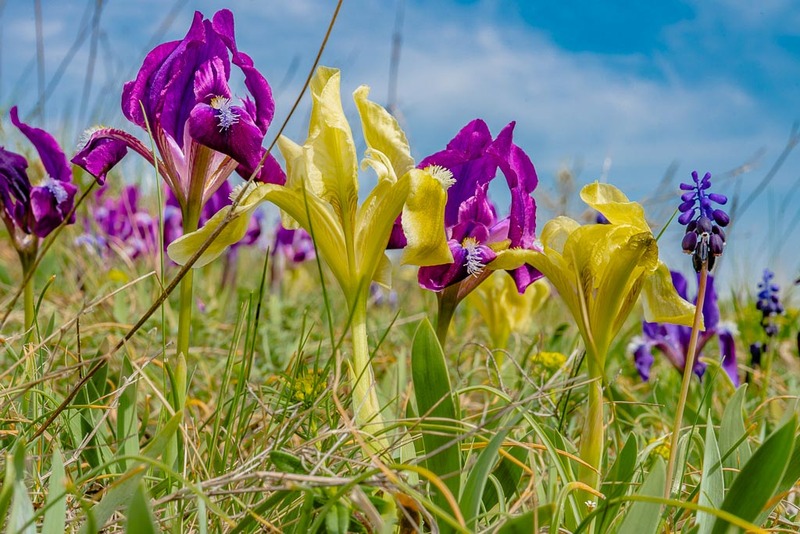 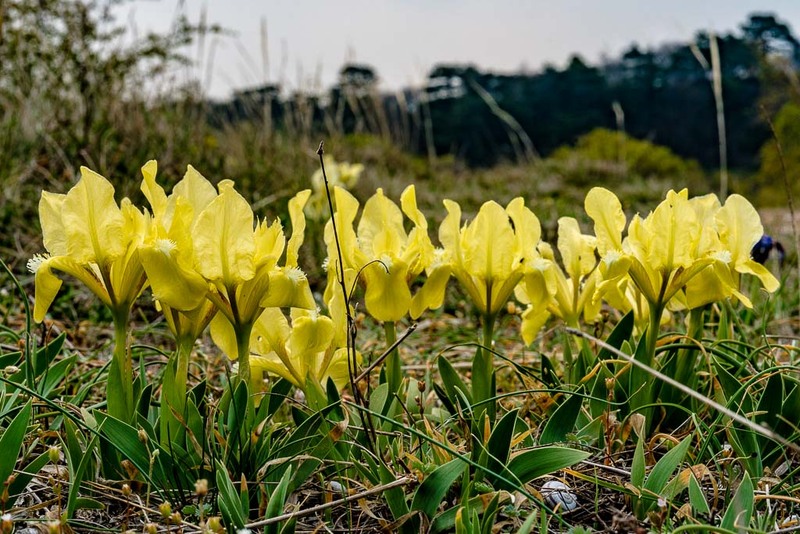 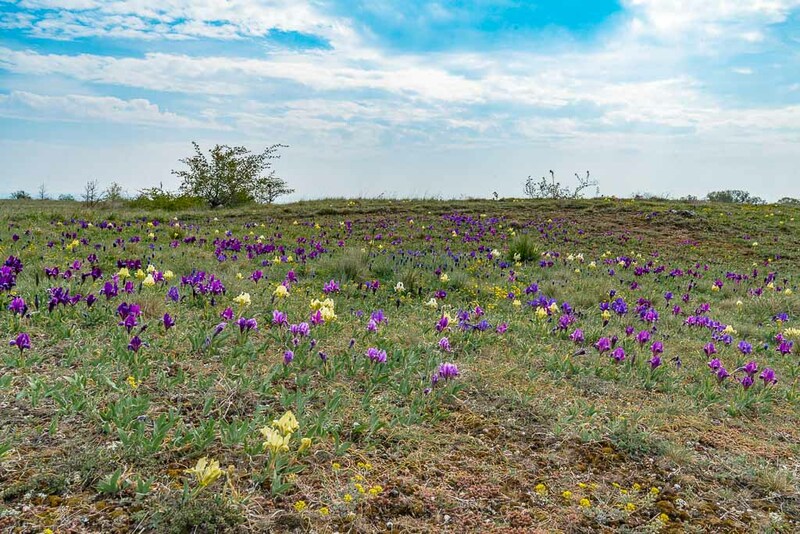 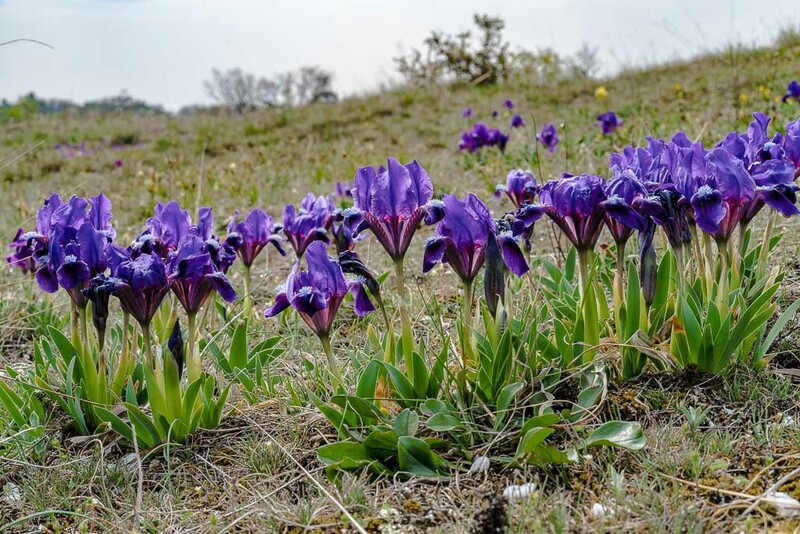 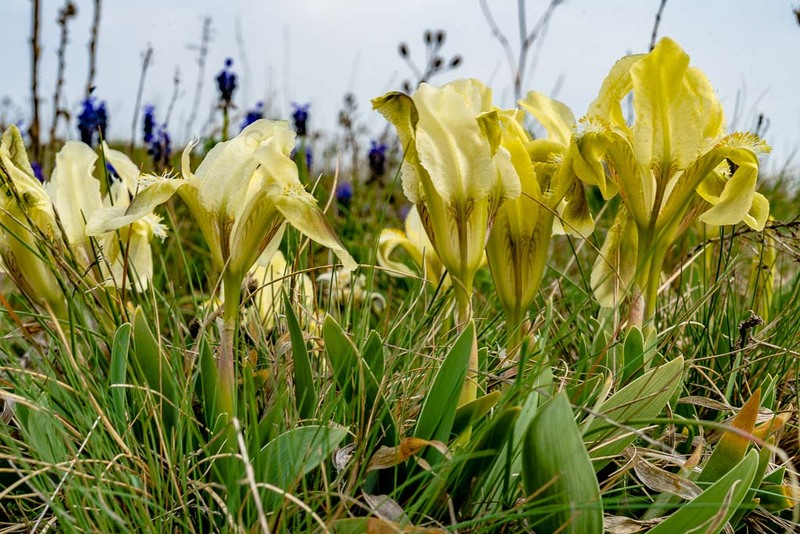 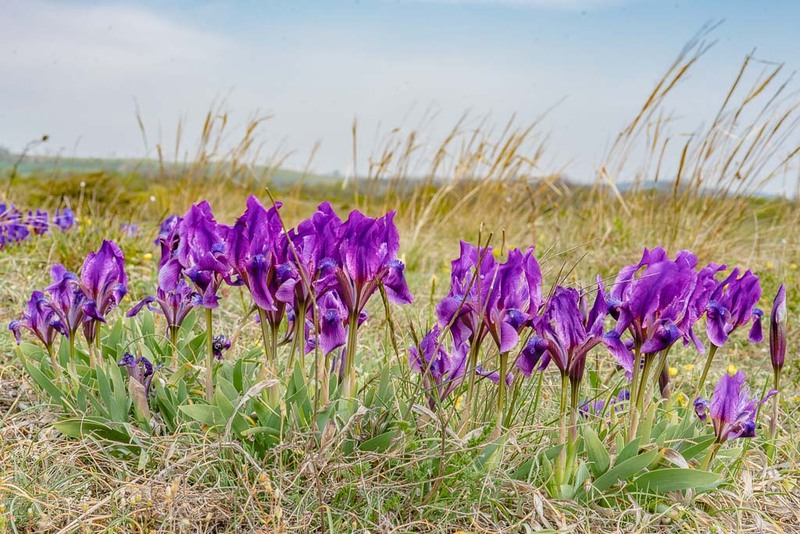 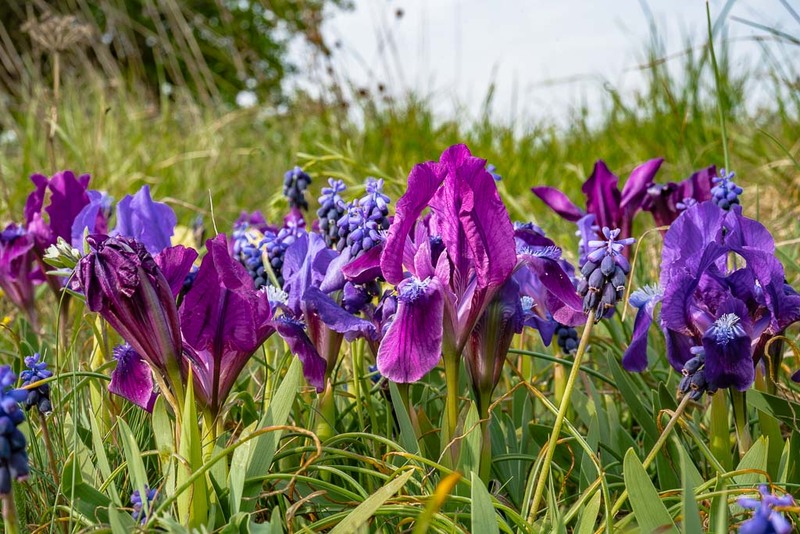 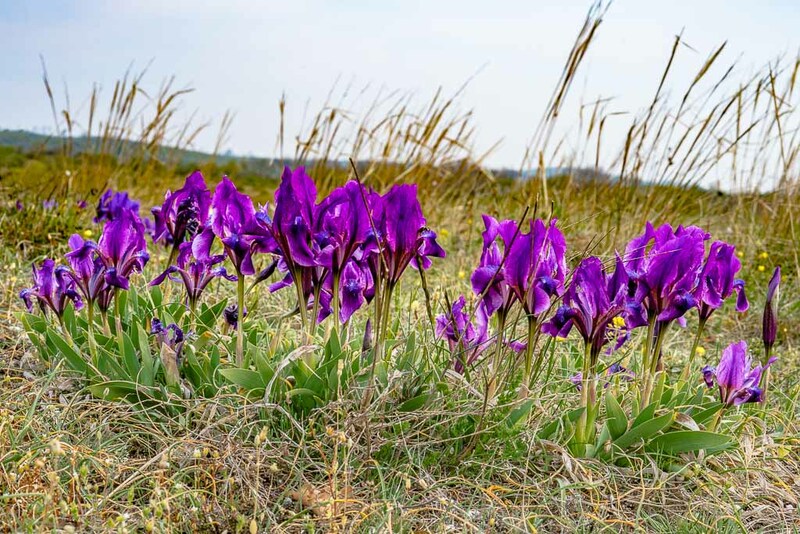 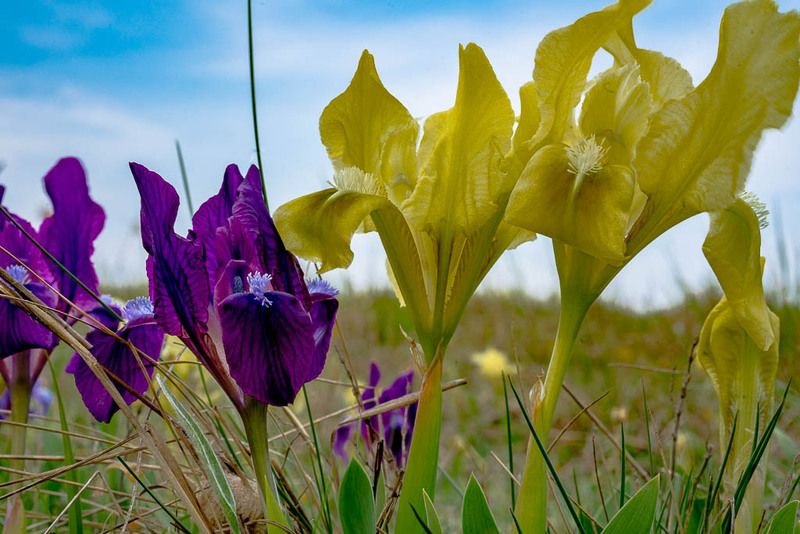 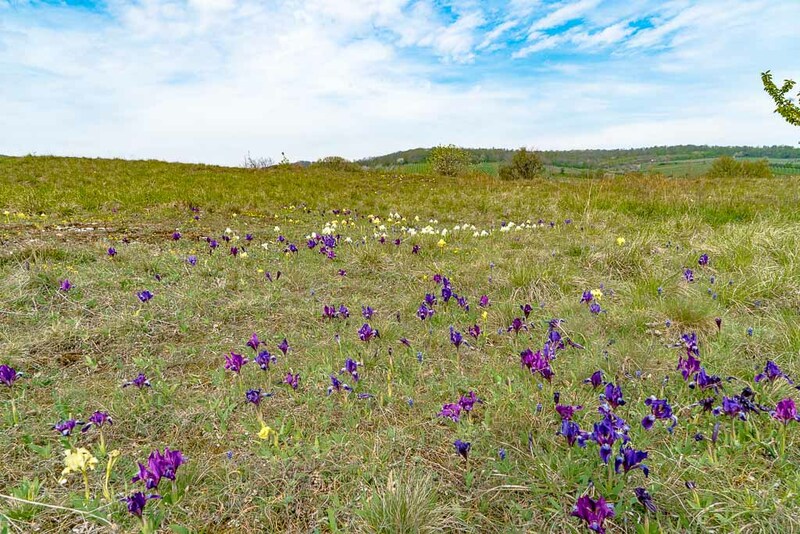 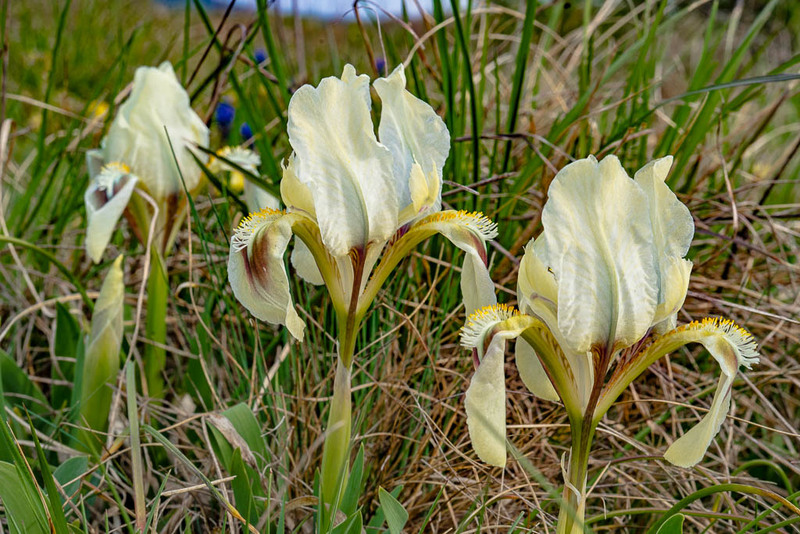 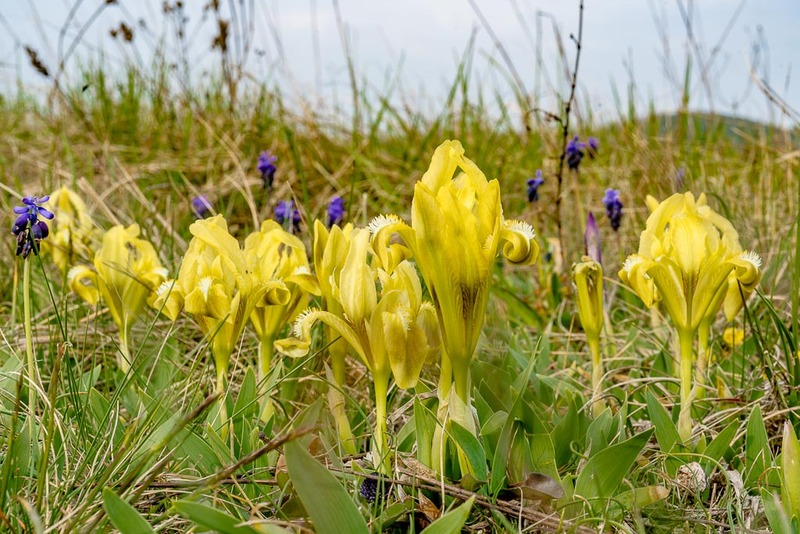 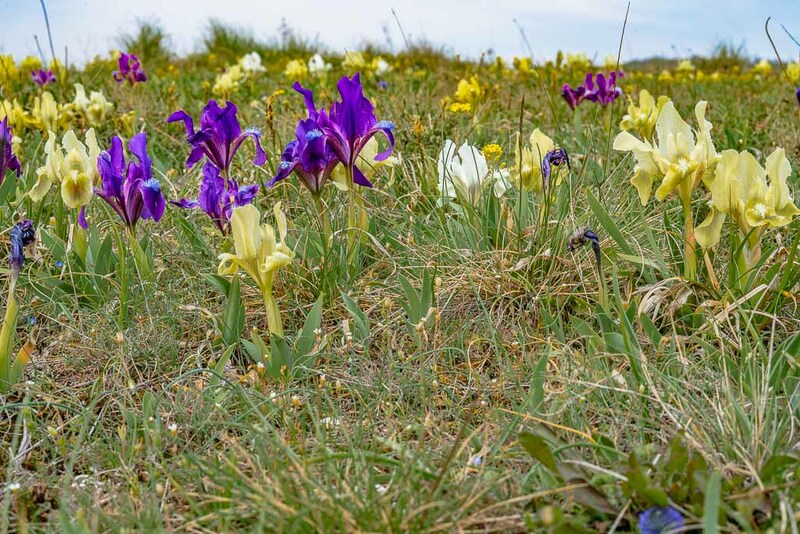 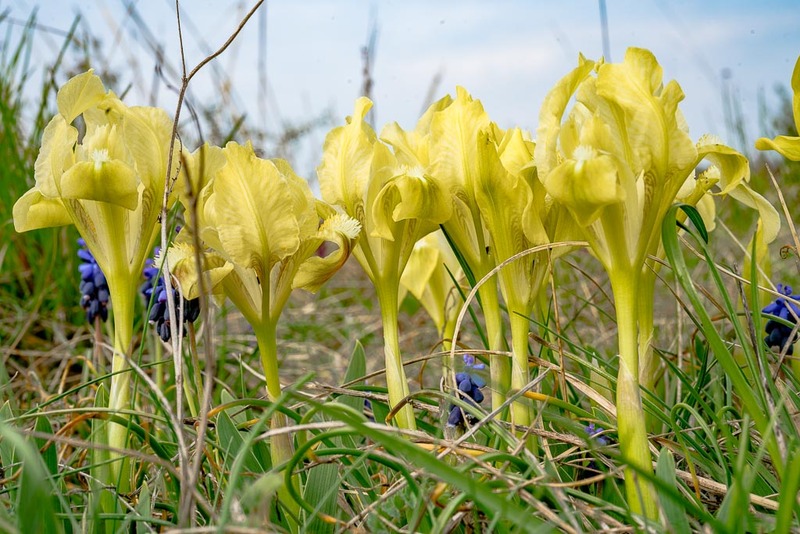 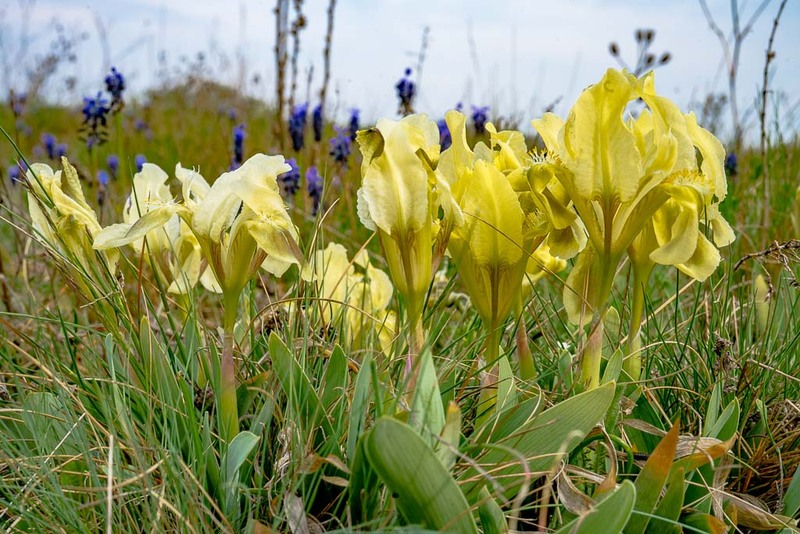 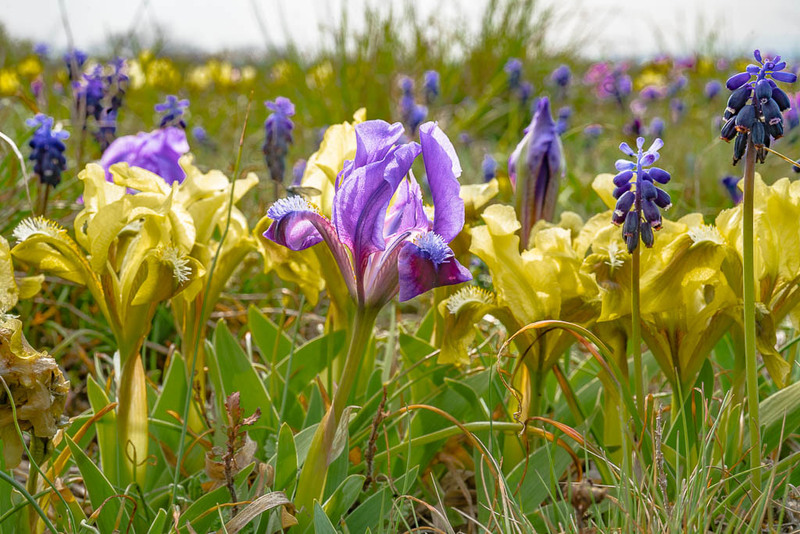 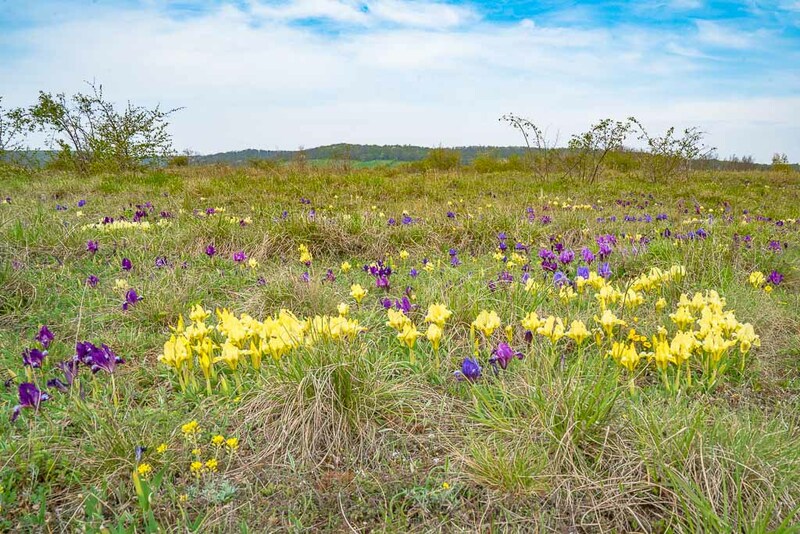 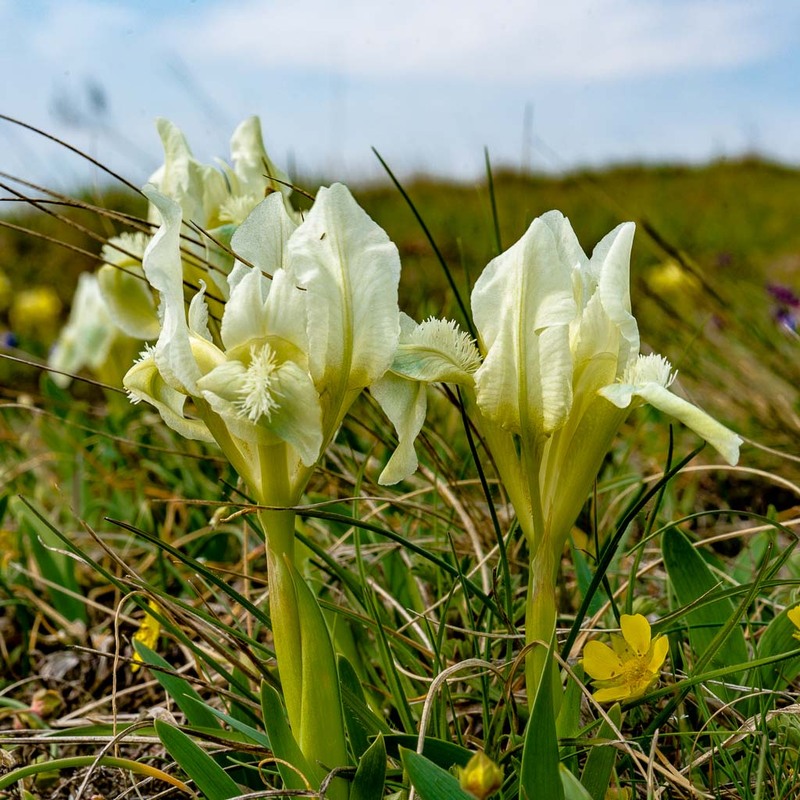 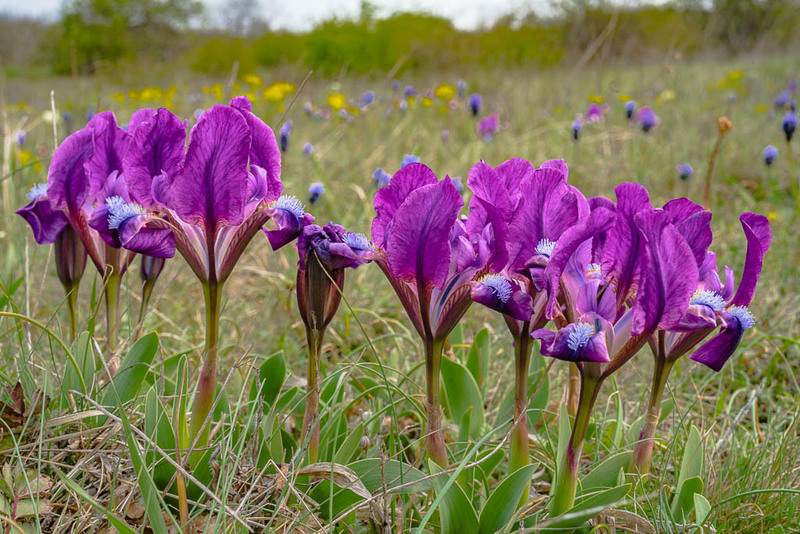 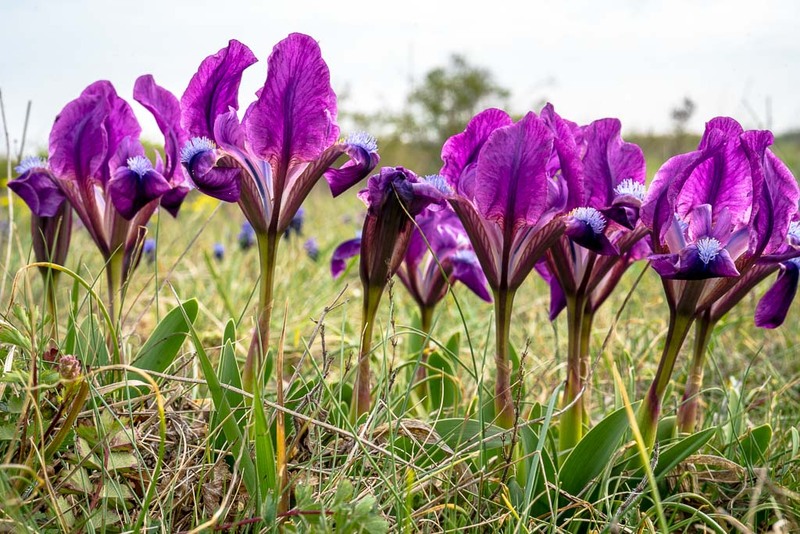 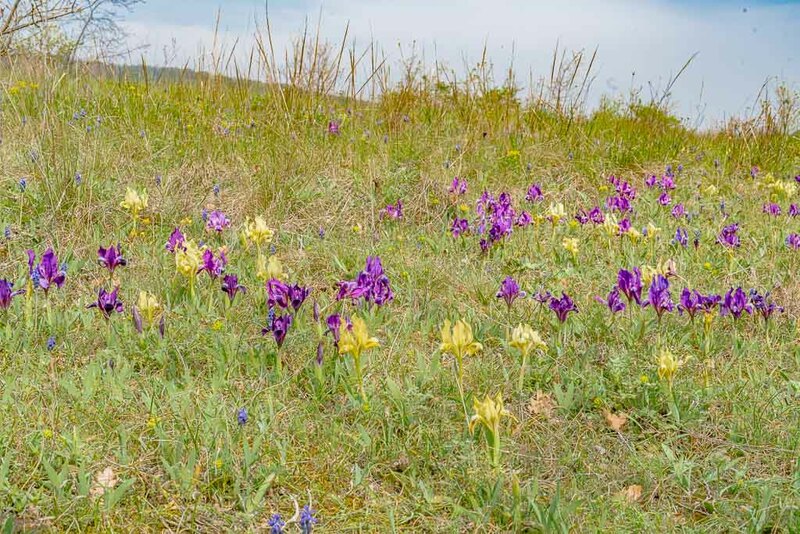 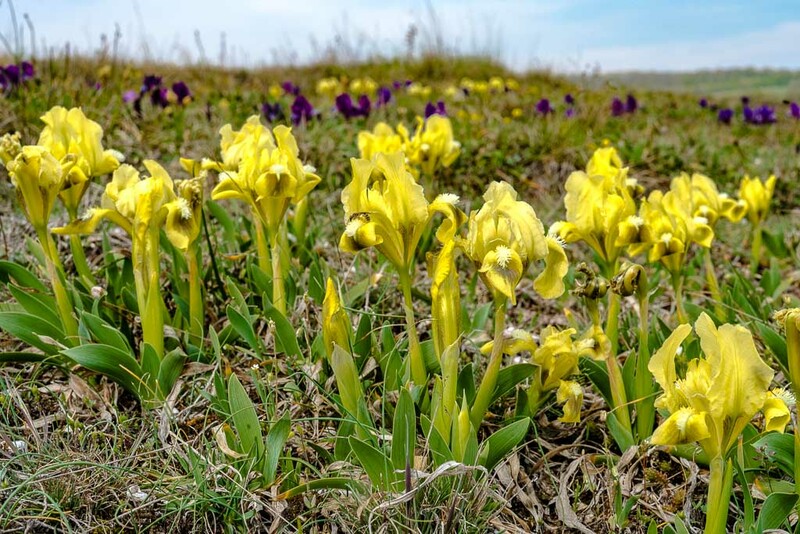 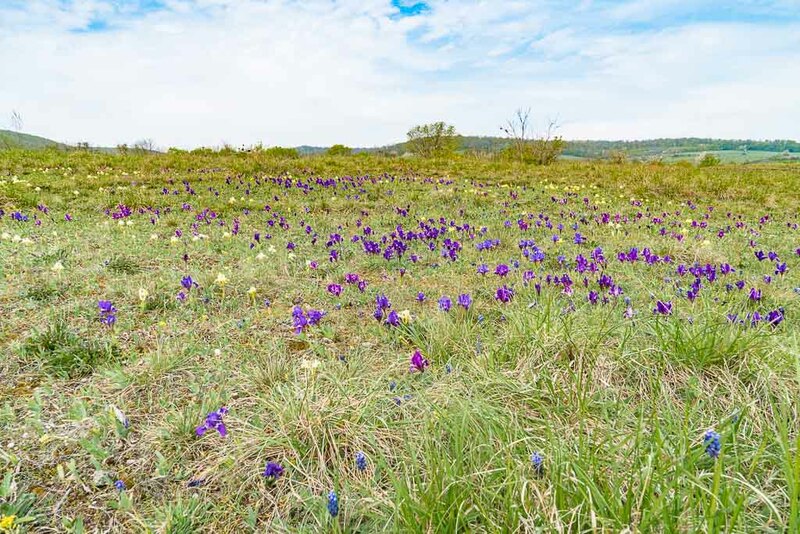 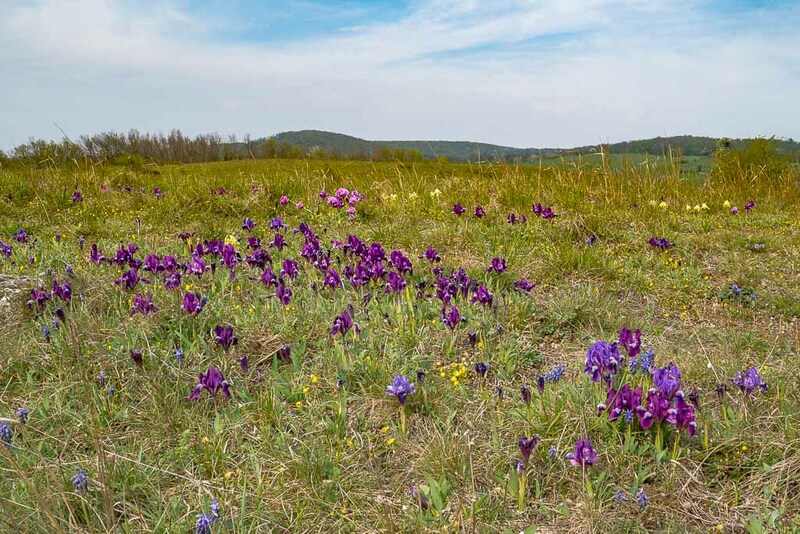 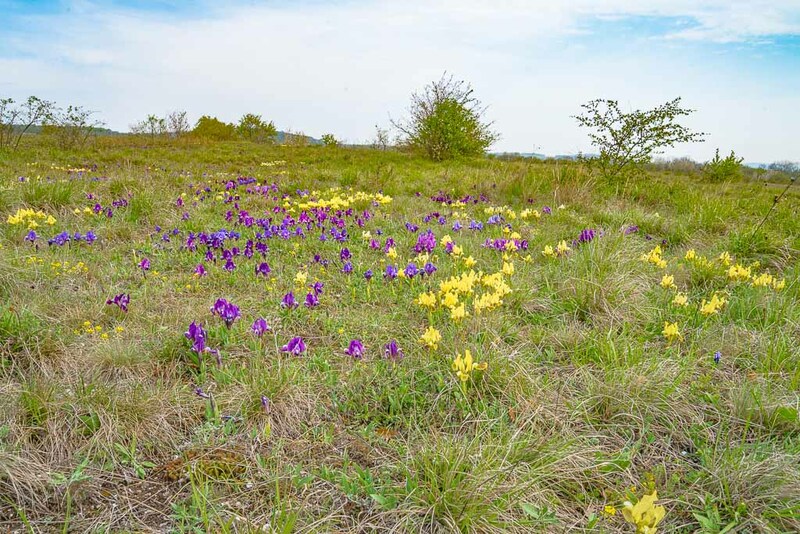 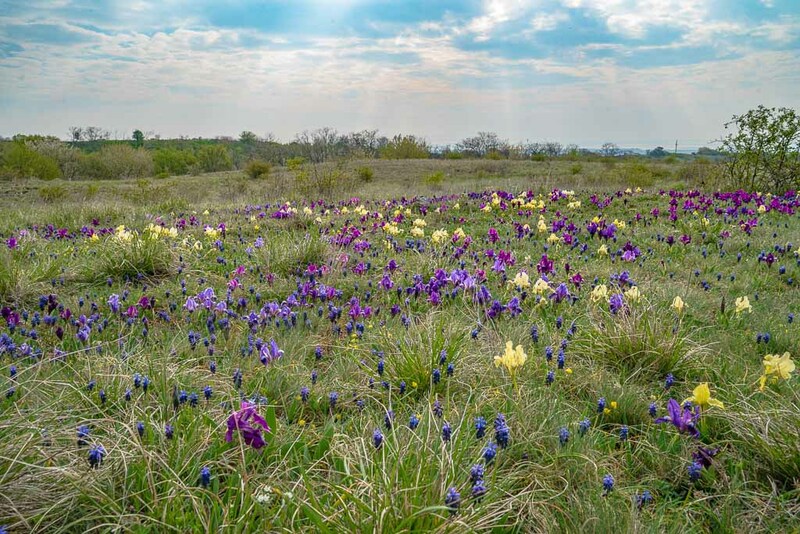 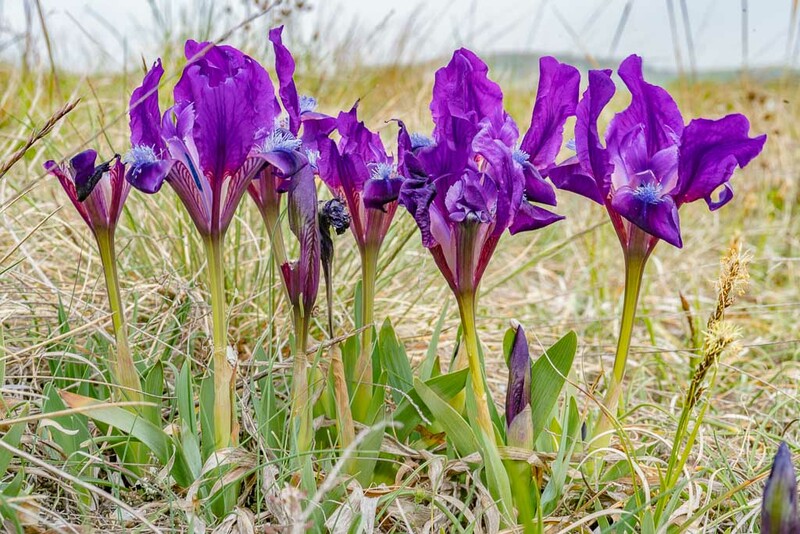 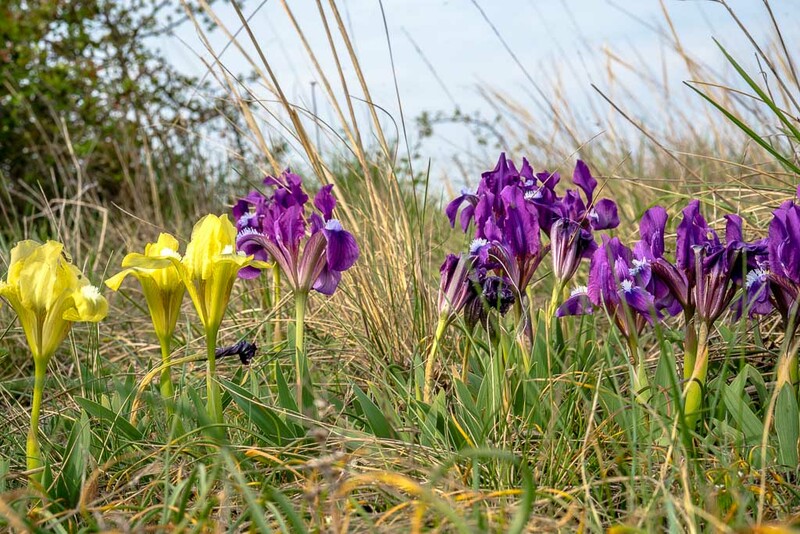 After repeatedly being informed that the so called Thenauriegel, a semi-dry grassland near Breitenbrunn (on the eastern slopes of the Leitha mountains) is home of thousands of dwarf iris. 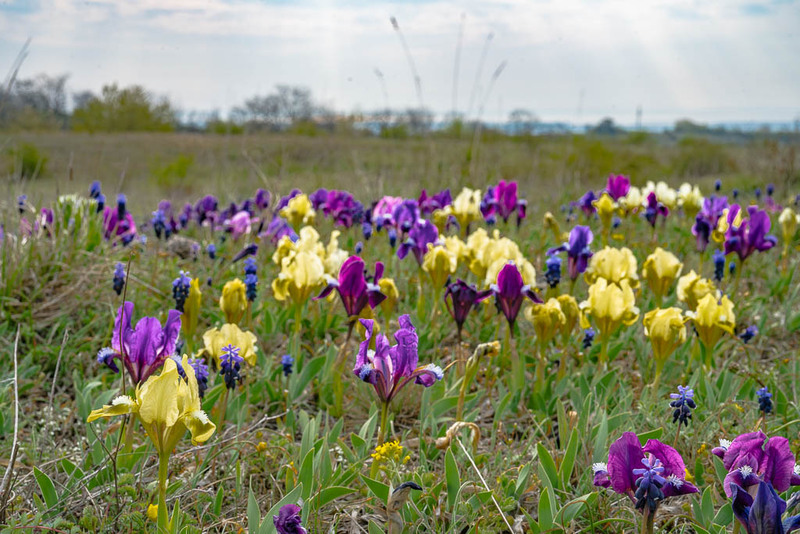 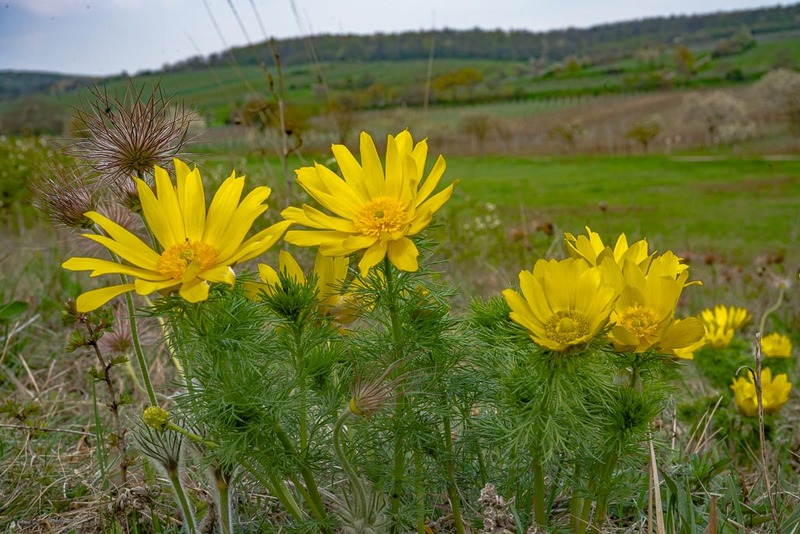 As they are in flower near my home, I start early morning to the Burgenland. 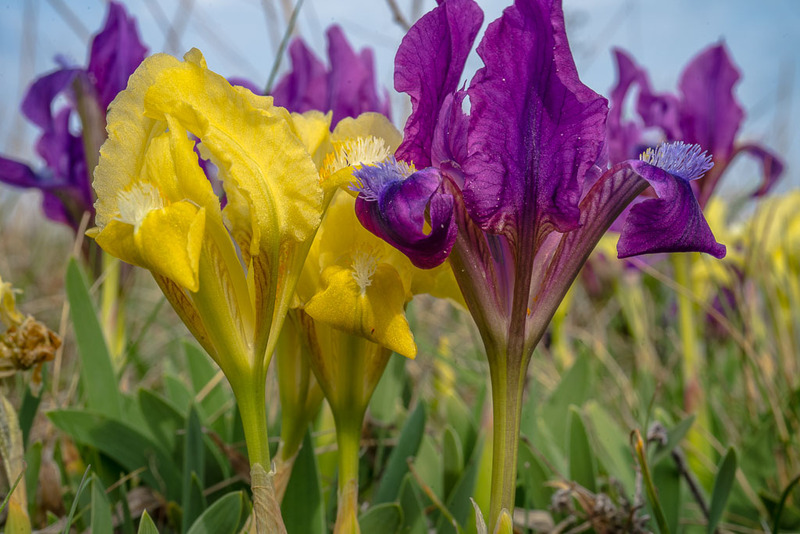 To give a brief translation: the flower colour polymorphism comes from hocusing the pollinators. 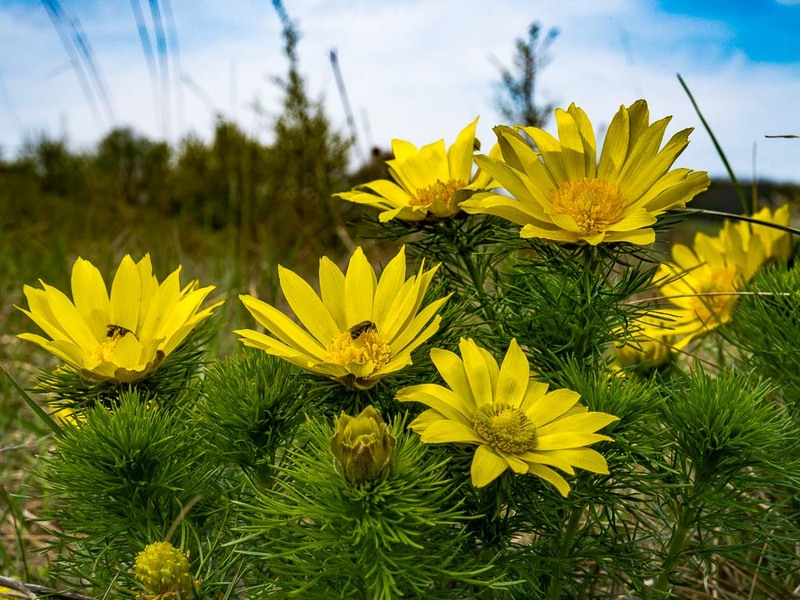 Bumblebees remember the colour of the flowers. 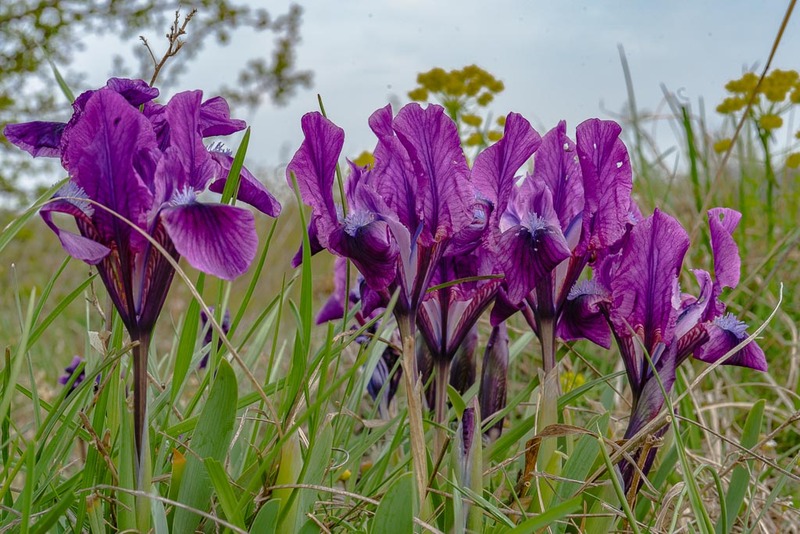 Being disappointed by the fact, that the flowers don´t give nectar, they choose to try other flowers with another colour (in hope of success this time) and visit differently coloured iris´ - once more being disappointed. 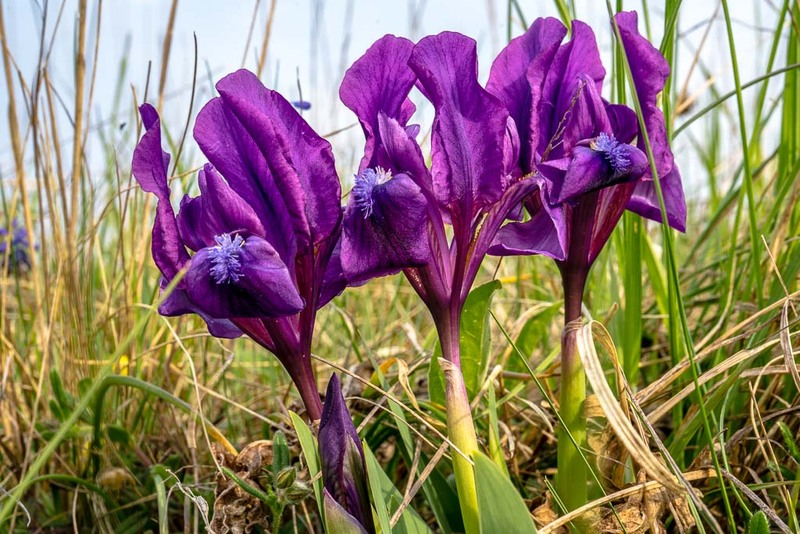 So, they change from one colour to the other and always mix up the genes. 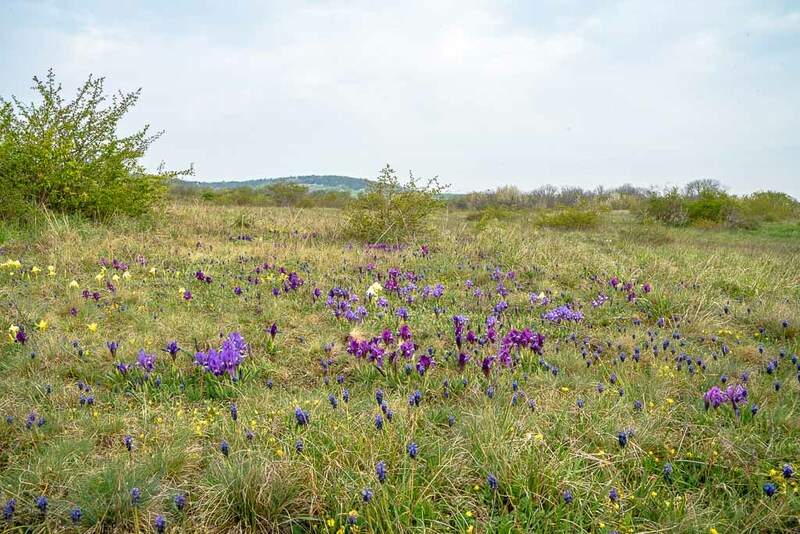 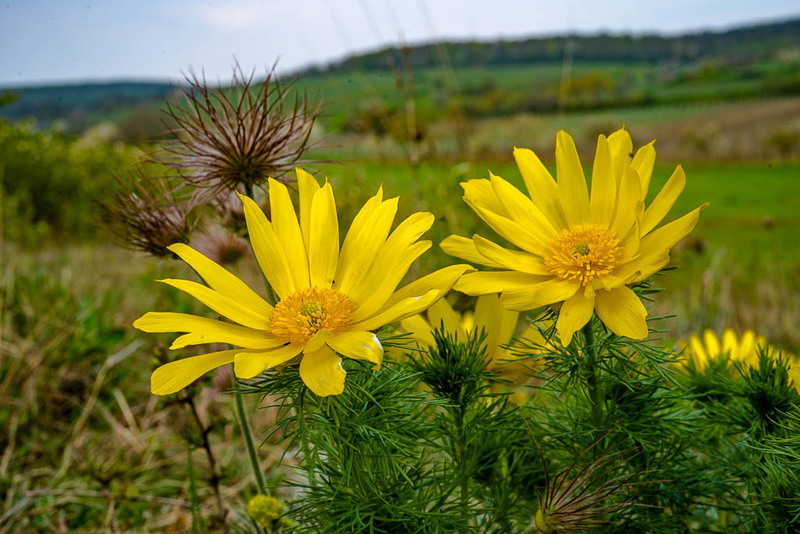 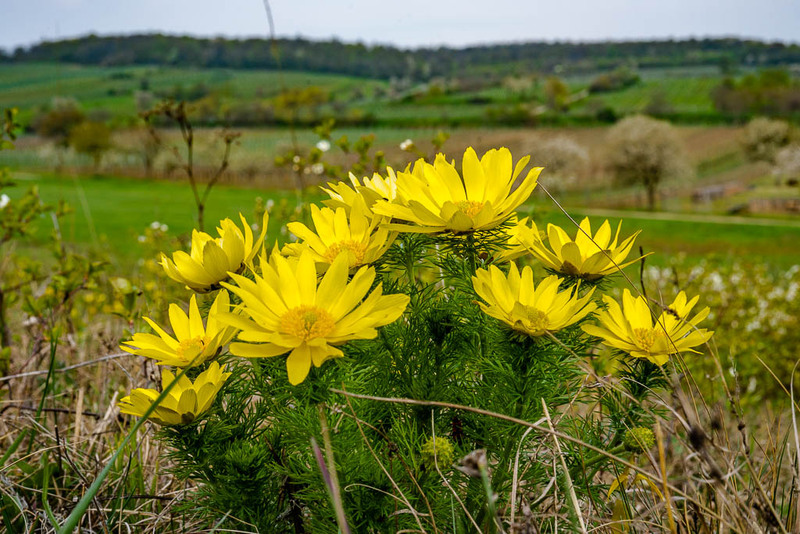 This is called "cross over-pollination"
http://burgenlandflora.at/ is a highly professional site designed by experts of the Naturschutzbund Burgenland and gives lots of information about all species growing all over Burgenland, completed by more information about plant communities, ecosystems, protected areas, walking routes and much more. 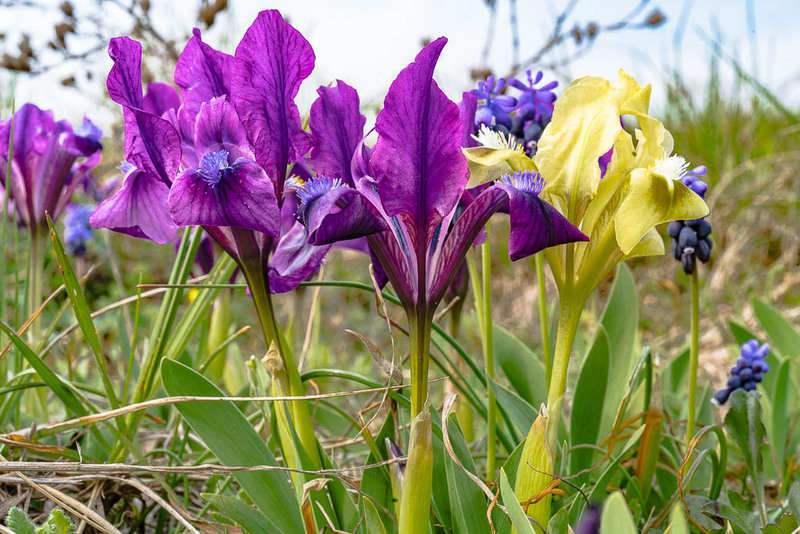 Due to permanent cross-breeding of the variants, one can find dozens of different colours. 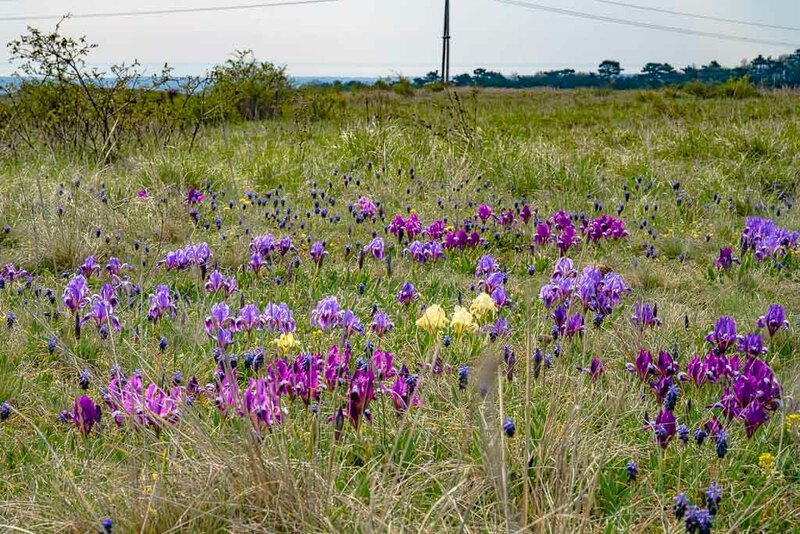 The single plants form meshworks of storage roots (rootstocks or rhizomes) thus covering larger areas, so multiple small flower carpets of identical colour join together to large, varicoloured areas, at culmination time of bloom with thousands of flowers. 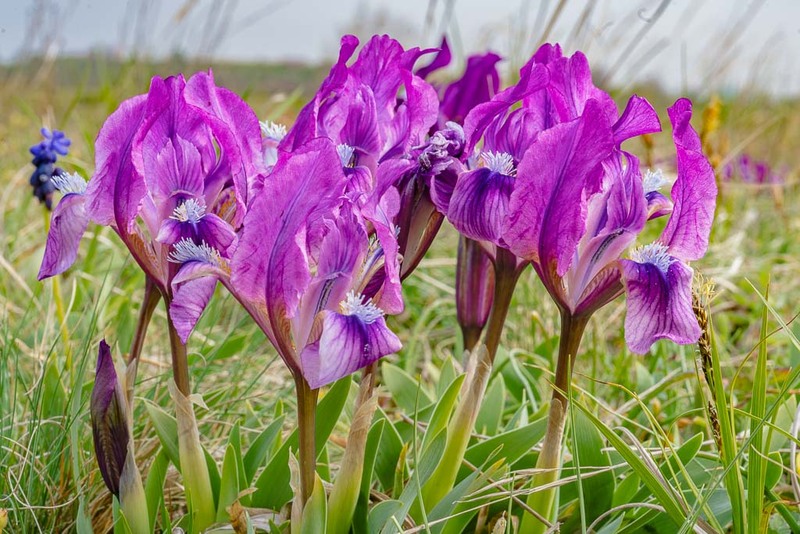 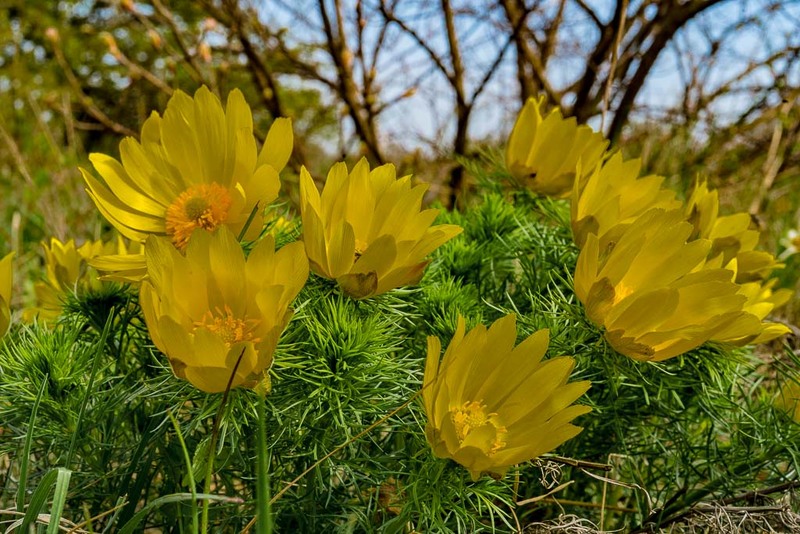 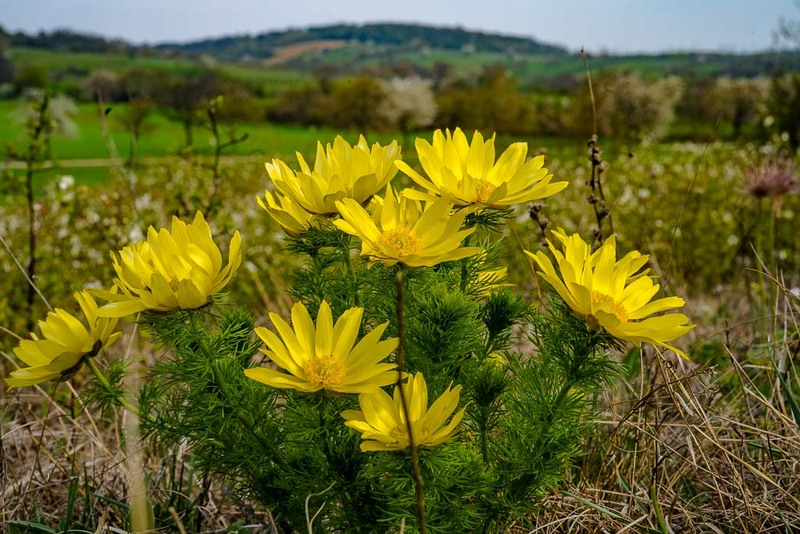 The only drawback is, that the time of flower is rather short, only one or two weeks during spring, this duration of course dependent of the weather. 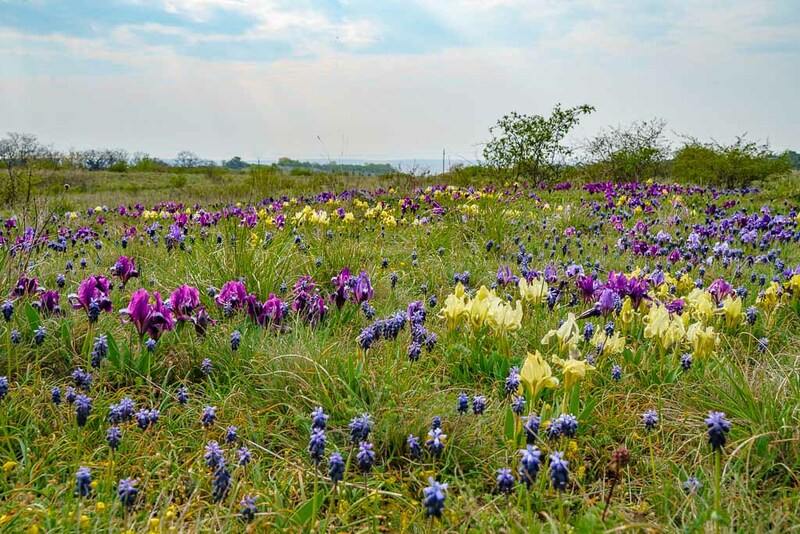 A multicoloured carpet of flowers. 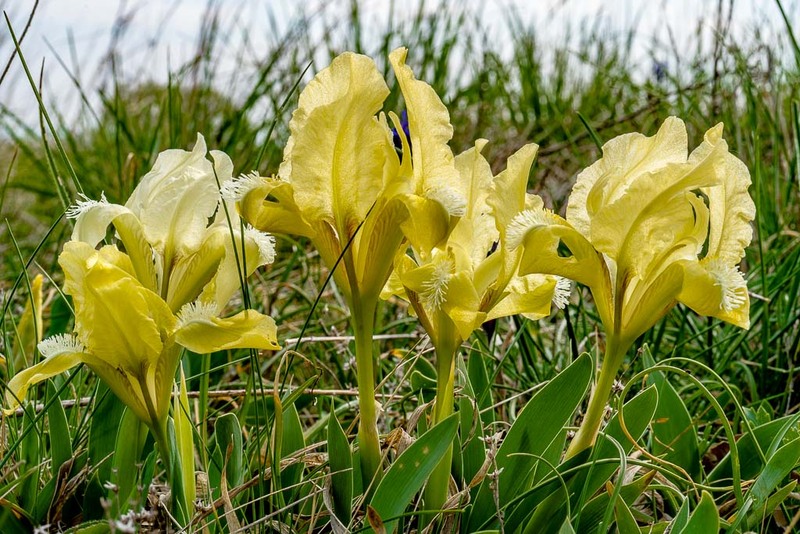 Dwarf iris (Iris pumila), this one light yellow, nealy white. 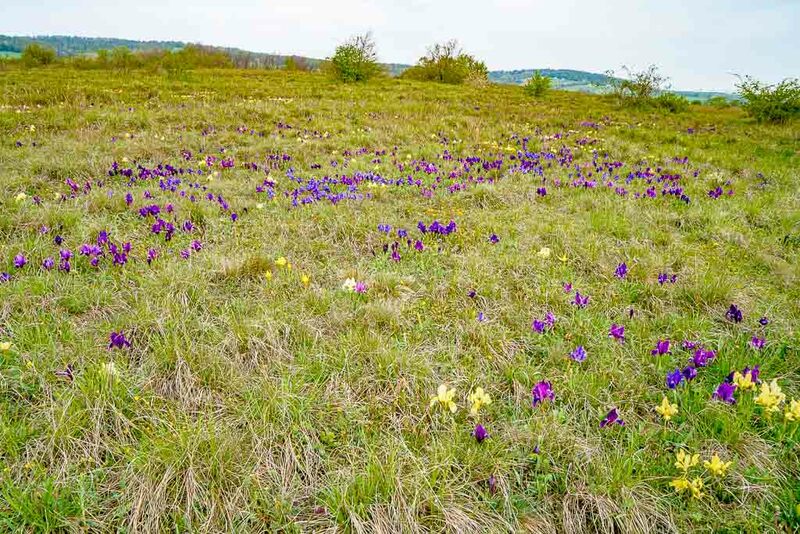 An unbelievable carpet of flowers !!! 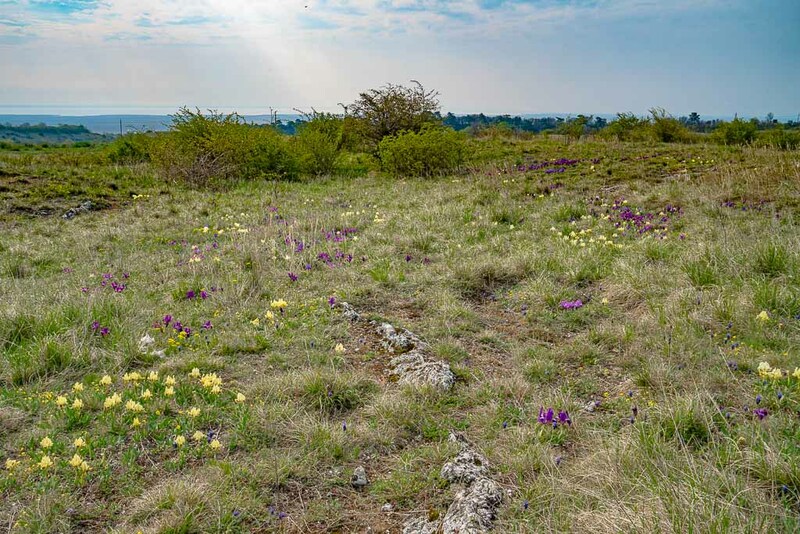 Lake Neusiedel can be seen in the distance. 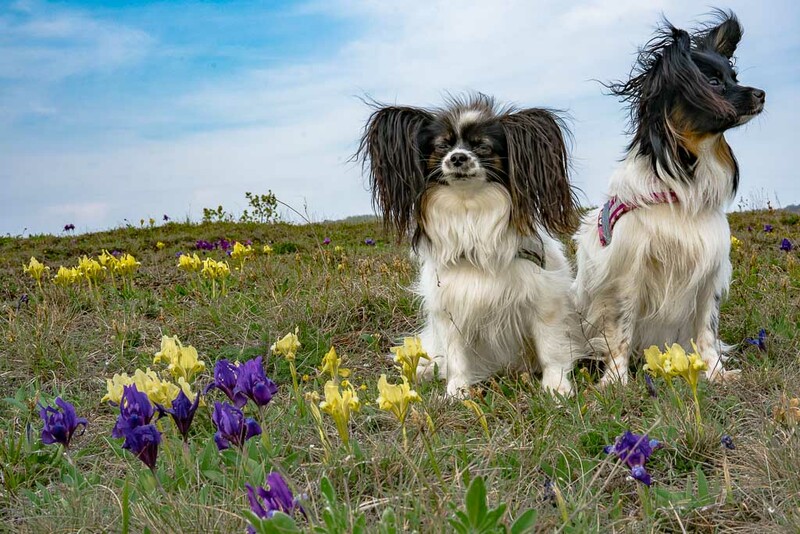 Lucy and Bella don´t have a good day, ´cause they must stay on the lead most of the time. 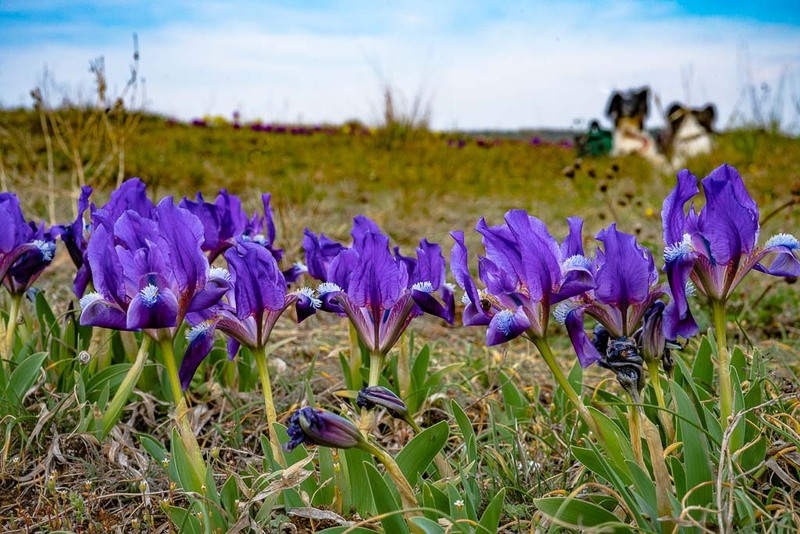 But they are extremy good dogs and wait patiently when I take pictures. 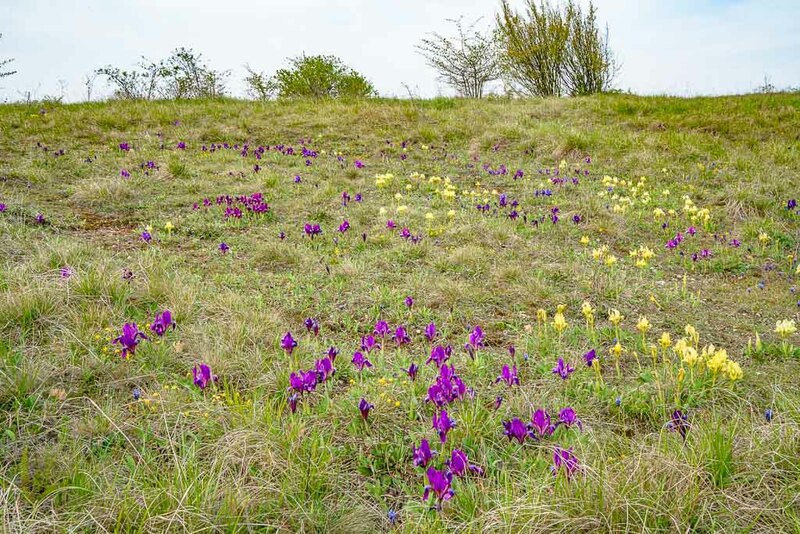 ... adding additional dots of colour. 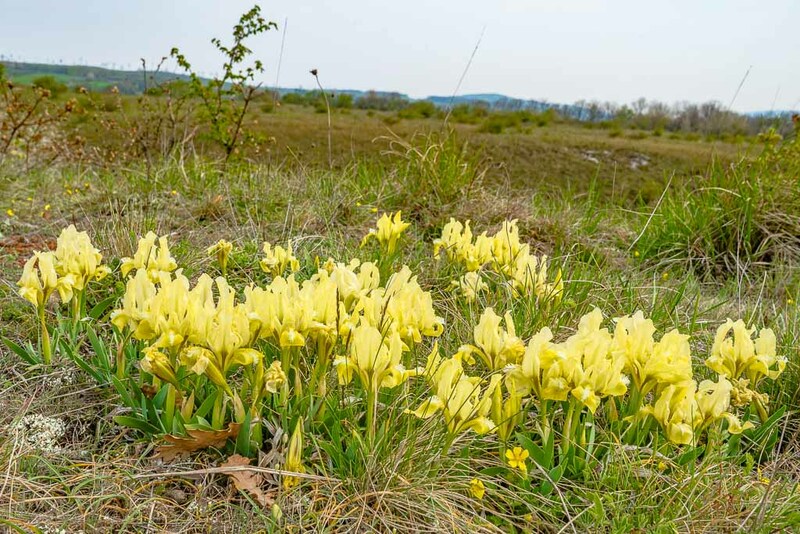 At the upper edge of the area, where it descends towards the Leitha mountains, there are hundreds of Spring adonis (Adonis vernalis) in flower. 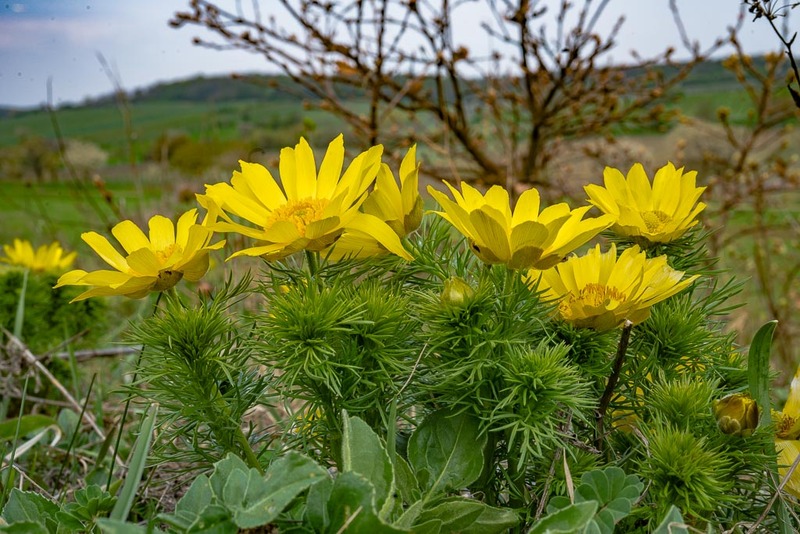 Spring adonis (Adonis vernalis) at the northwestern adge of the Thenauriegel - Leitha mountains in the background. 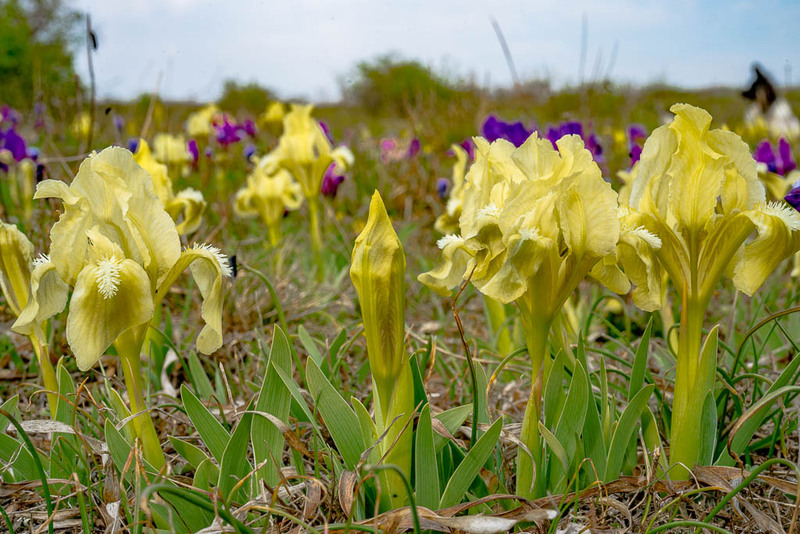 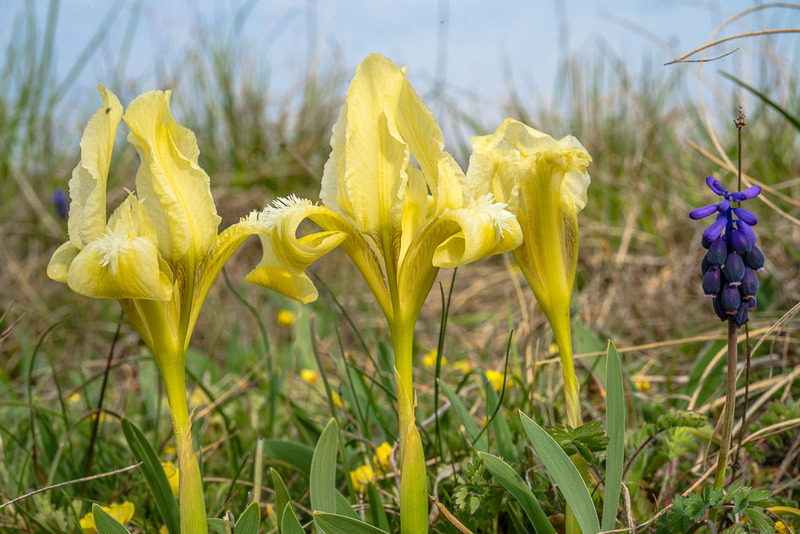 Back to the dwarf iris (Iris pumila), which don´t grow in the area of the spring adonis (and vice versa) - unbeliebable, how specialized some plants are. 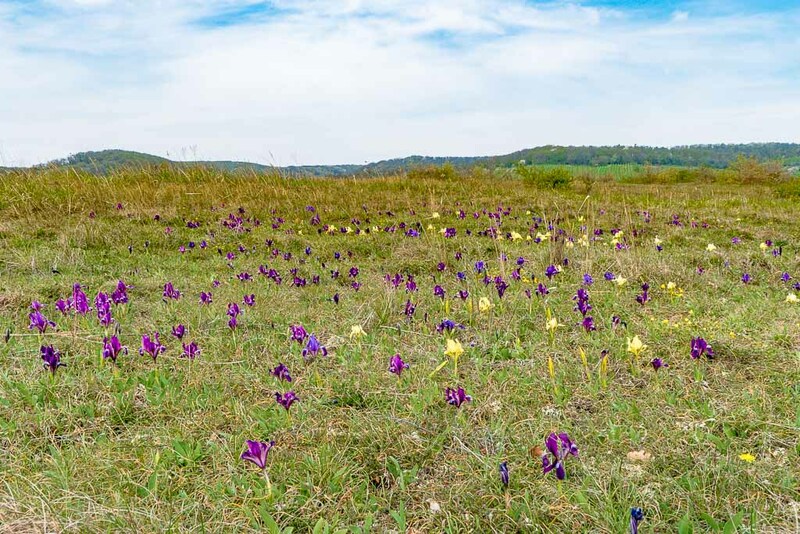 Limestone rocks on the surface in some places. 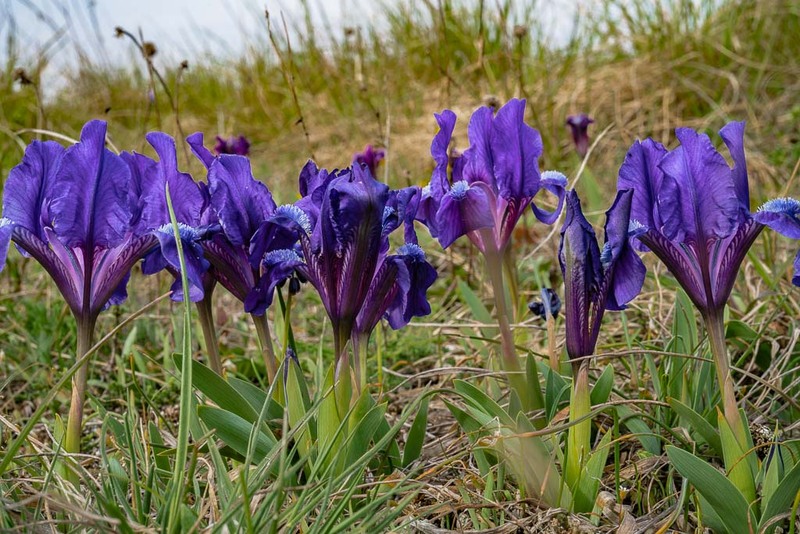 These dwarf iris (Iris pumila)are nearly dark blue. 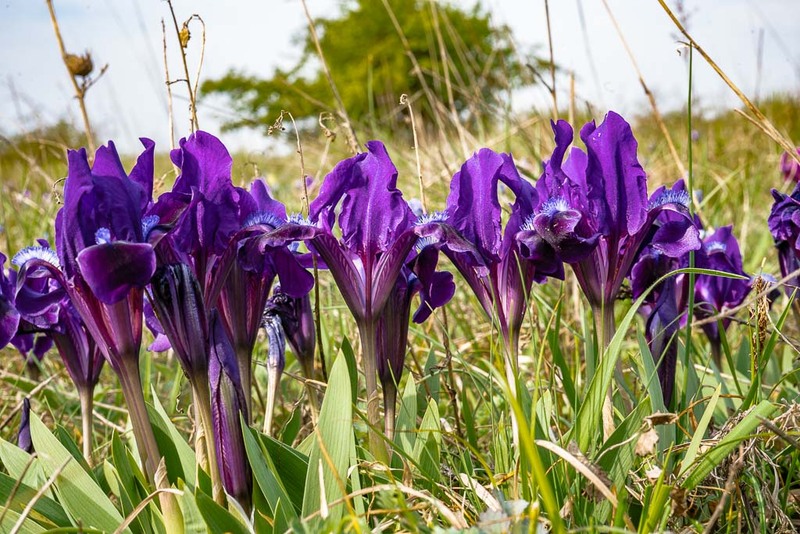 These are nearly white, with violet areas. 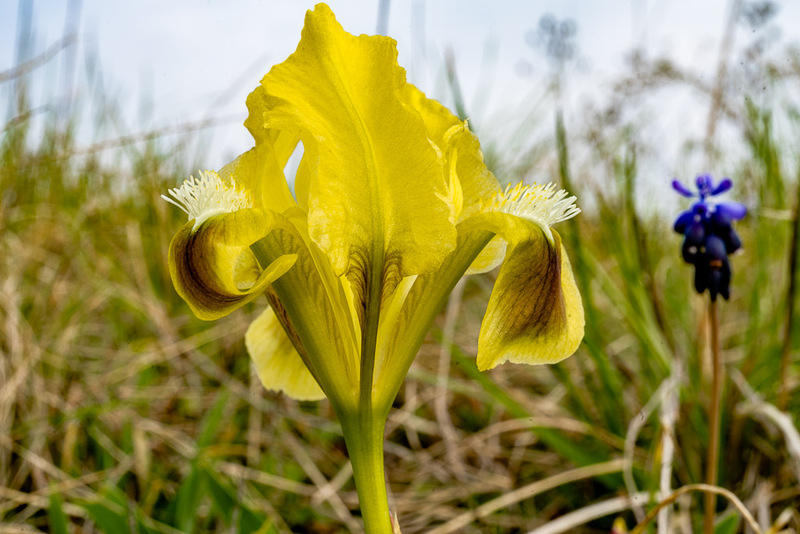 This variant is rather rare. 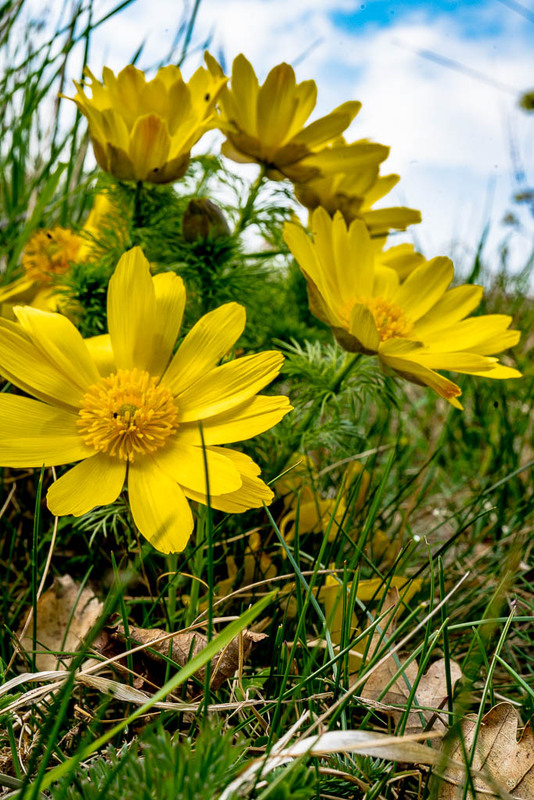 All these flowers seem to belong to a single plant, forming a rhizome. 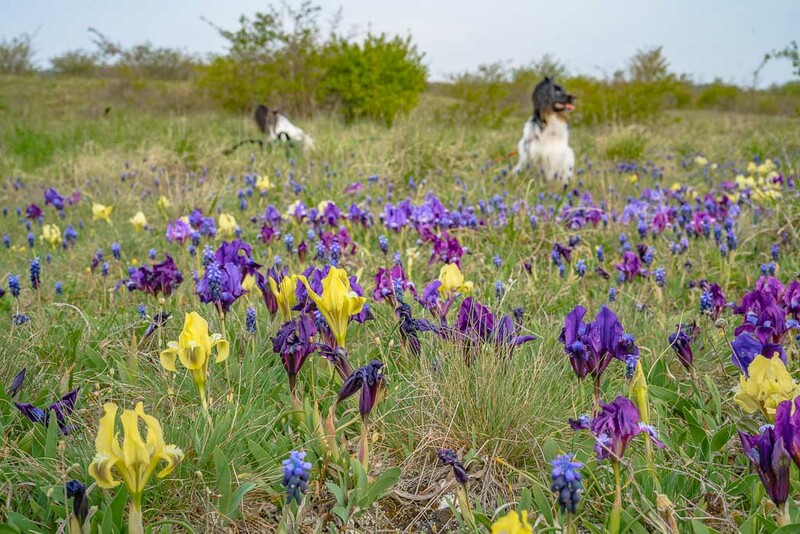 They´re both very patient today. 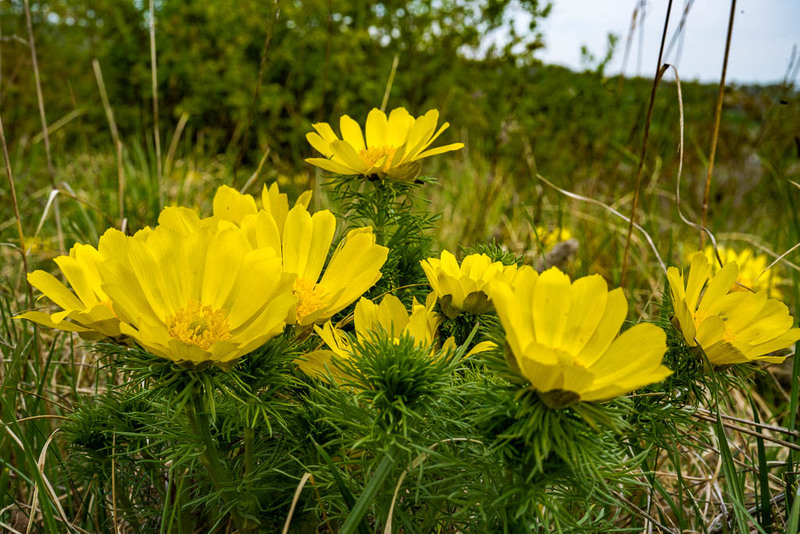 This seems to be a single plant. 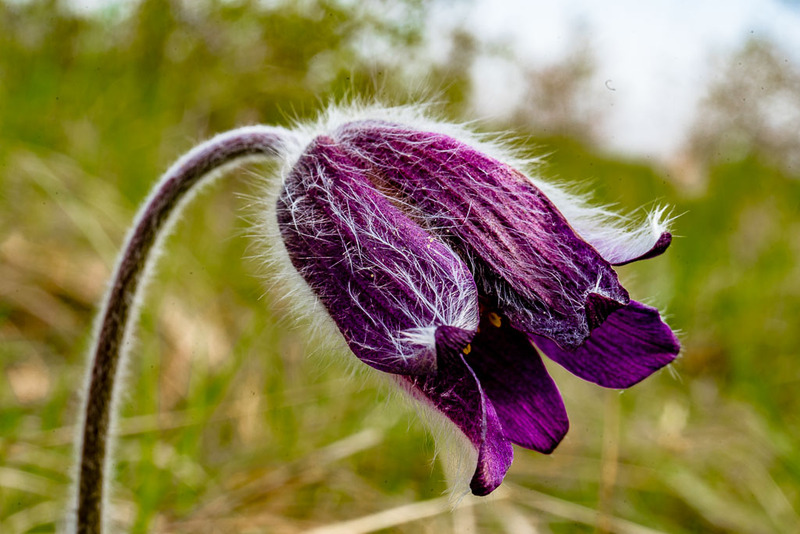 In a single place, on the edge near the bush, a flower which I originally identified as small pasque flower (Pulsatilla pratensis). 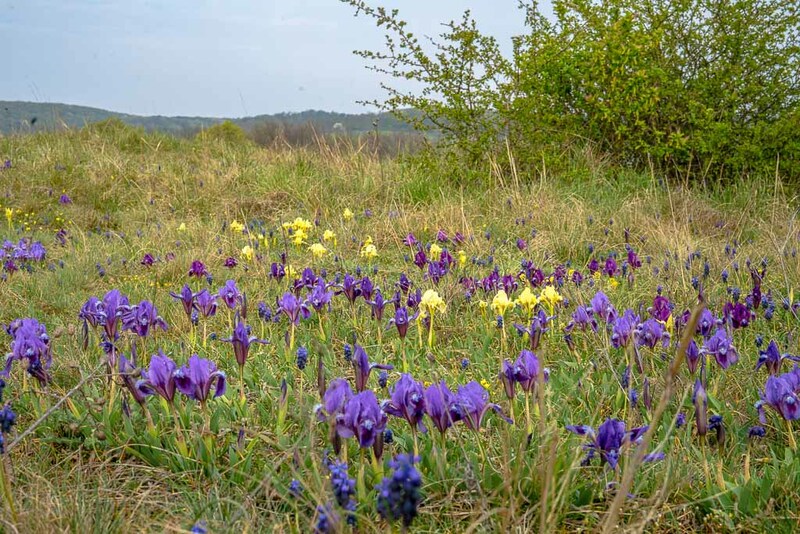 Prof. Manfred A. Fischer, one of the experts of the Burgenlandflora - site, answered to my offer of using some of my pictures that he regards that as a rare hybrid between the small pasque flower and the common pasque flower (pulsatilla grandis)The common pasque flower looks similar, however the flowers óf the small pasque flower are smaller, darker and bend down, and it flowers later in the year. 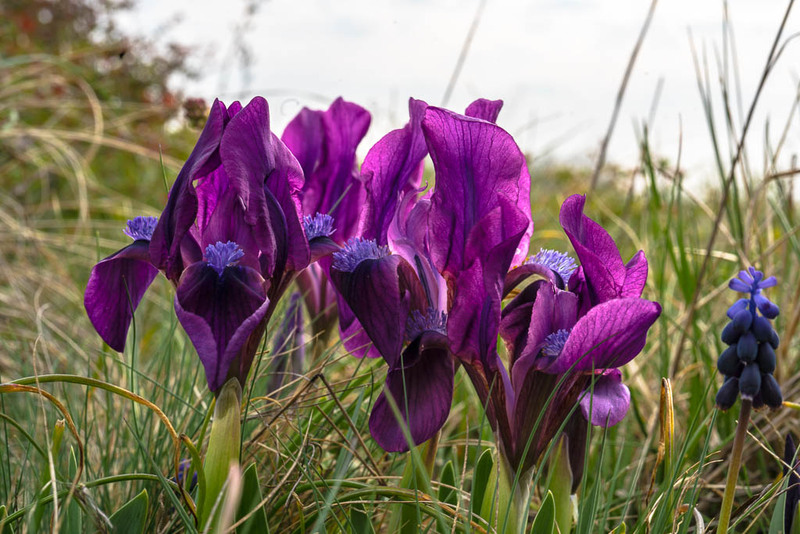 A few flowers however may come later, so also today, so this indeed may happen. 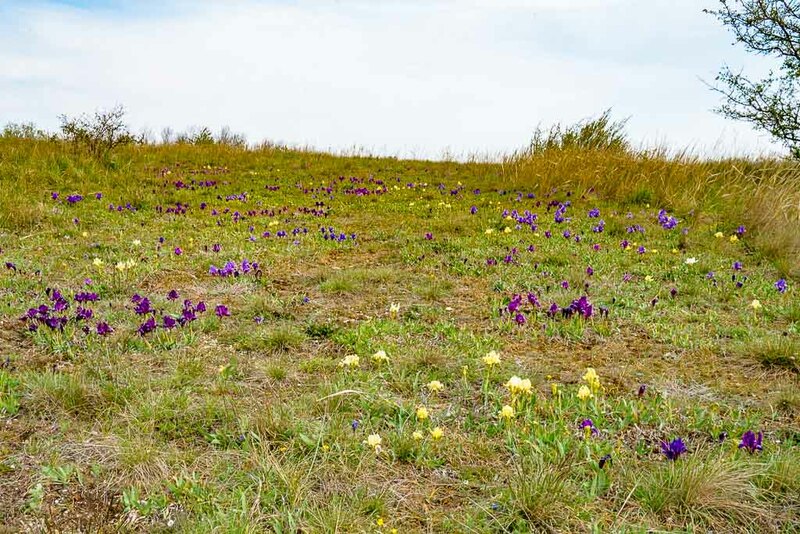 I found thousands of infructescences of the common pasque flower. 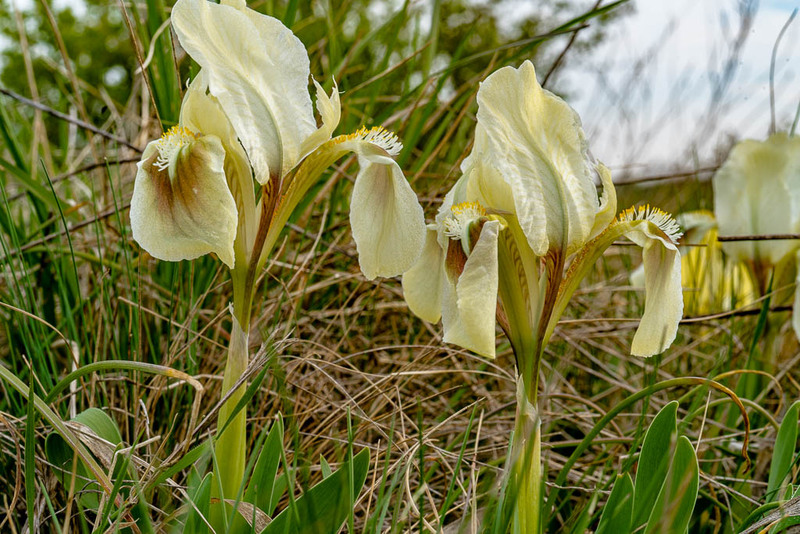 Very rare completely white variant of dwarf iris (Iris pumila). 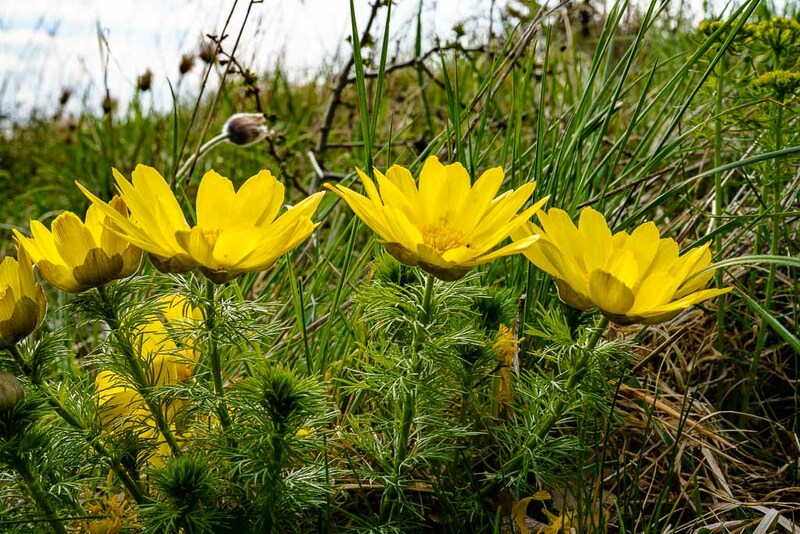 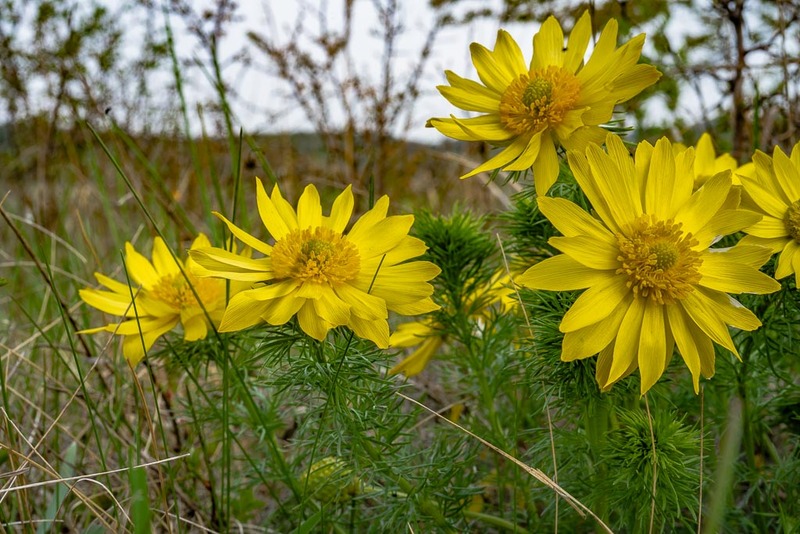 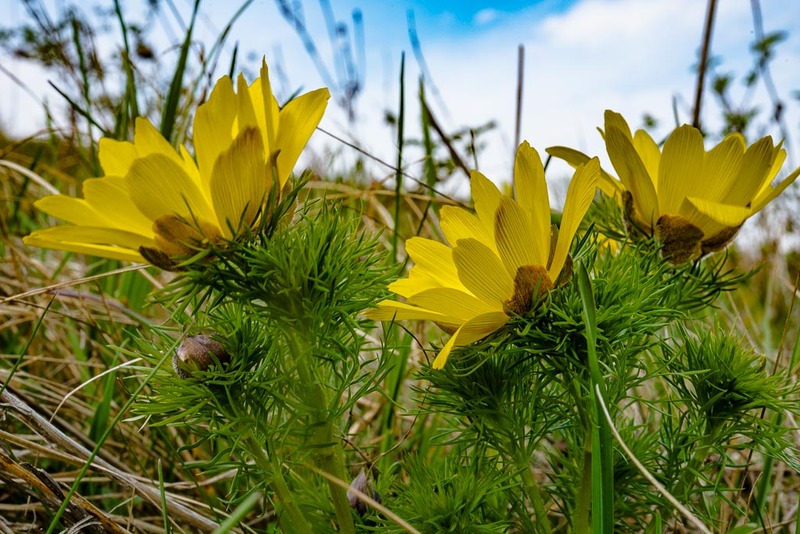 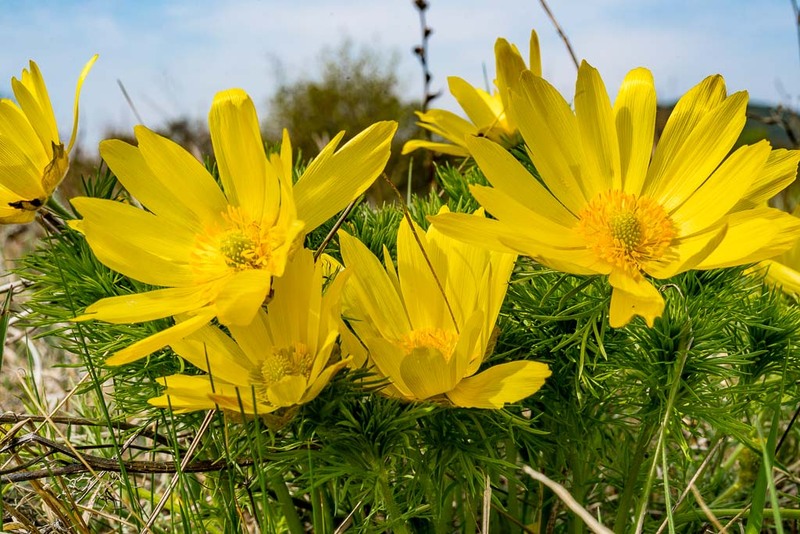 At the southwestern edge of the grassland, near the scrub, I once more find Spring adonis (Adonis vernalis). 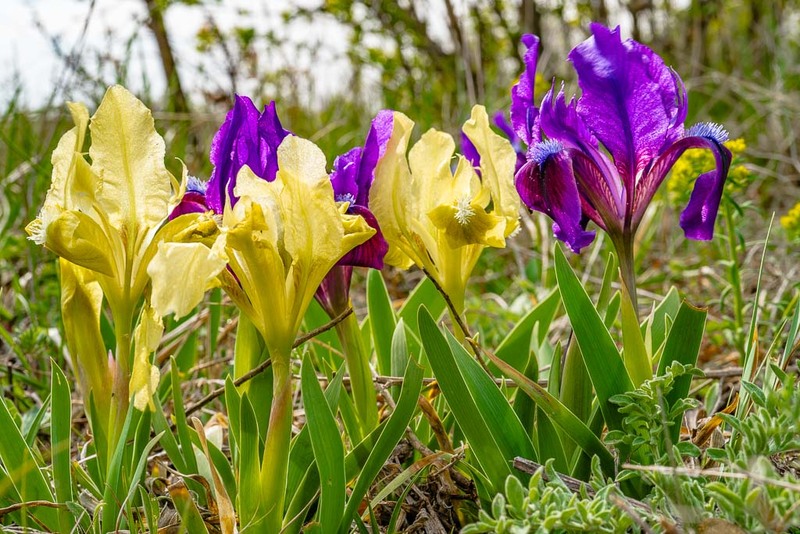 Another colourful mixture of dwarf iris (Iris pumila). 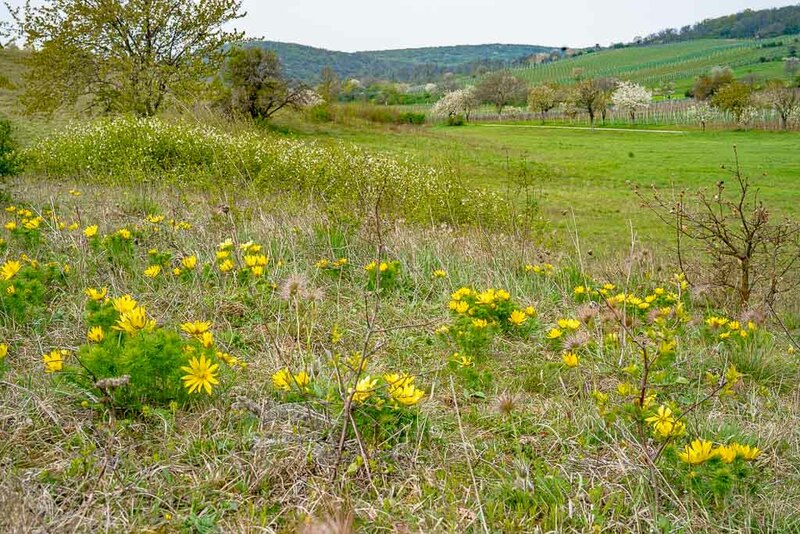 it seems to never come to an end, I´m already walking for 3 hours. 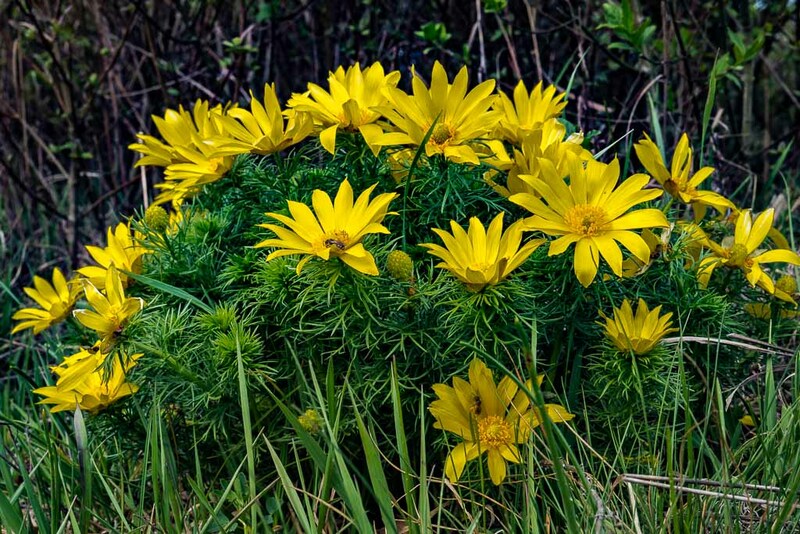 Behind the bushes on the southwestern egde, there is cultured land. 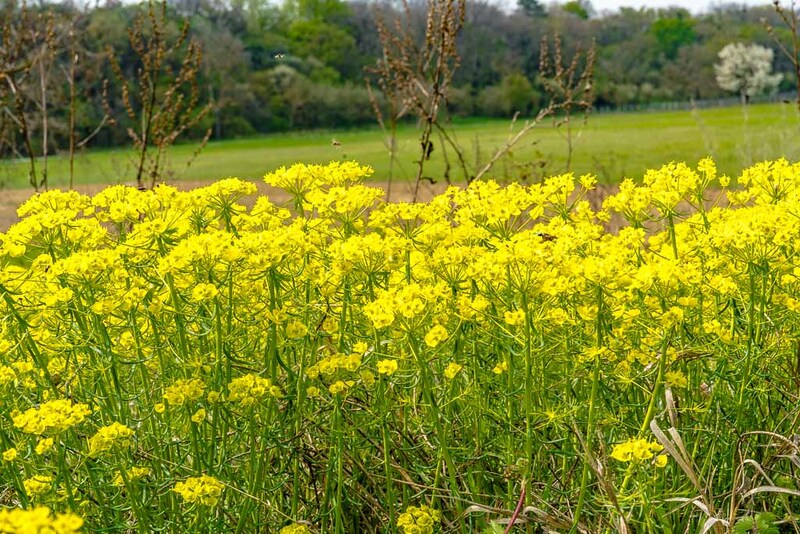 Lots of Cypress spurge (Euphorbia cyparissias). 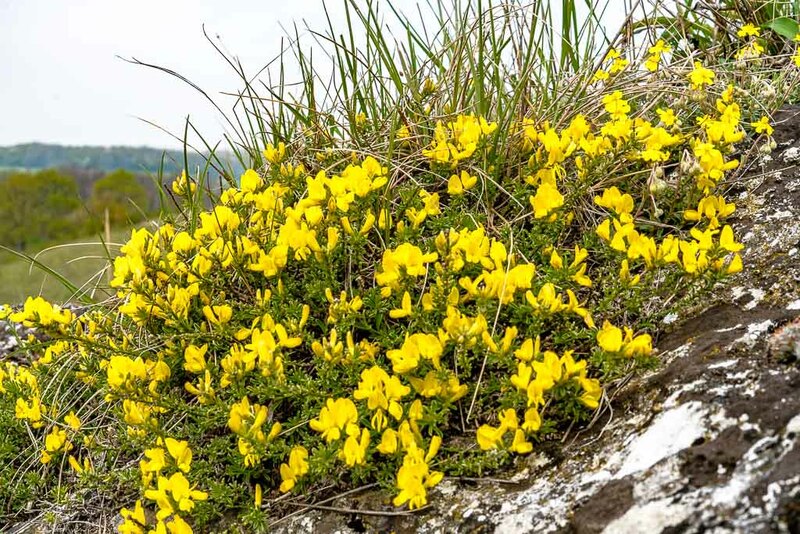 Near the rocks I find this hairy greenweed (Genista pilosa) - thanks to Prof. Manfred A. Fischer for the correction of my initial identification! 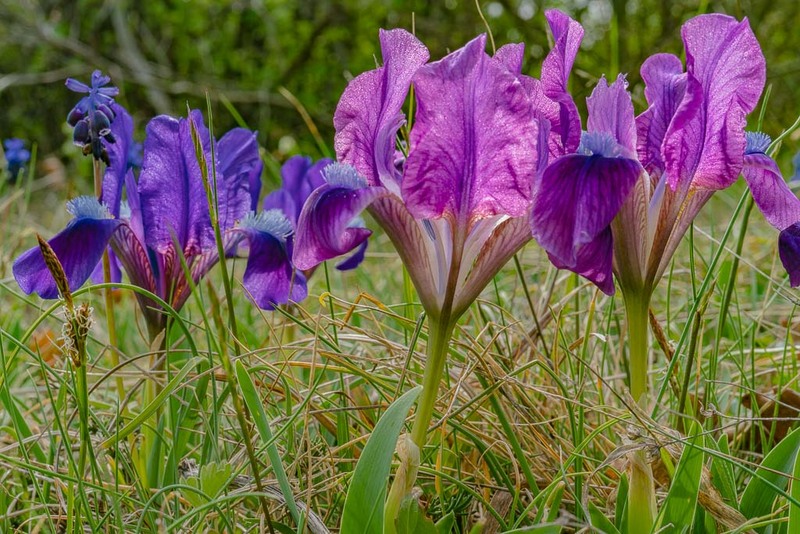 Back to the never ending dwarf iris (Iris pumila). 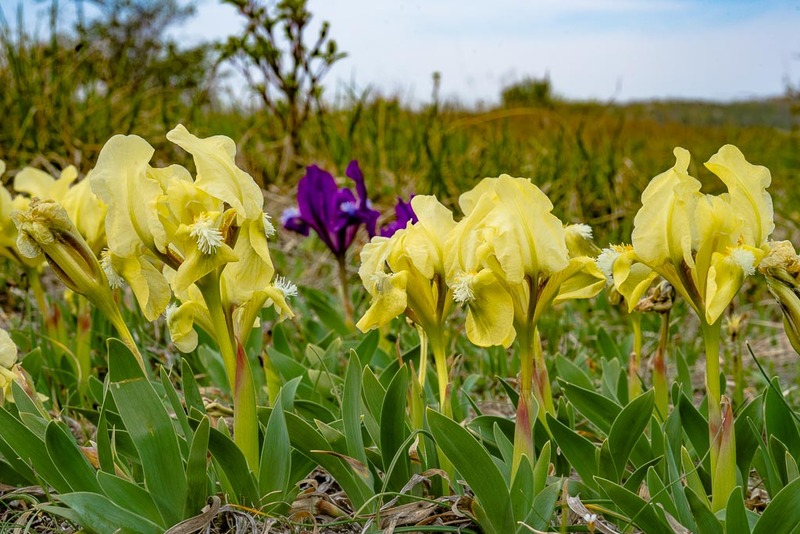 A last group of yellow Dwarf iris (Iris pumila). 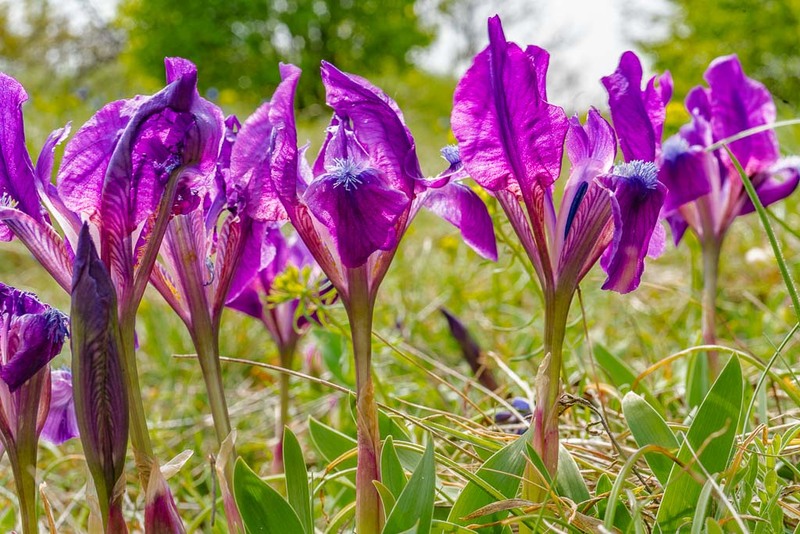 It is lunchtime now, I have to drive back home.